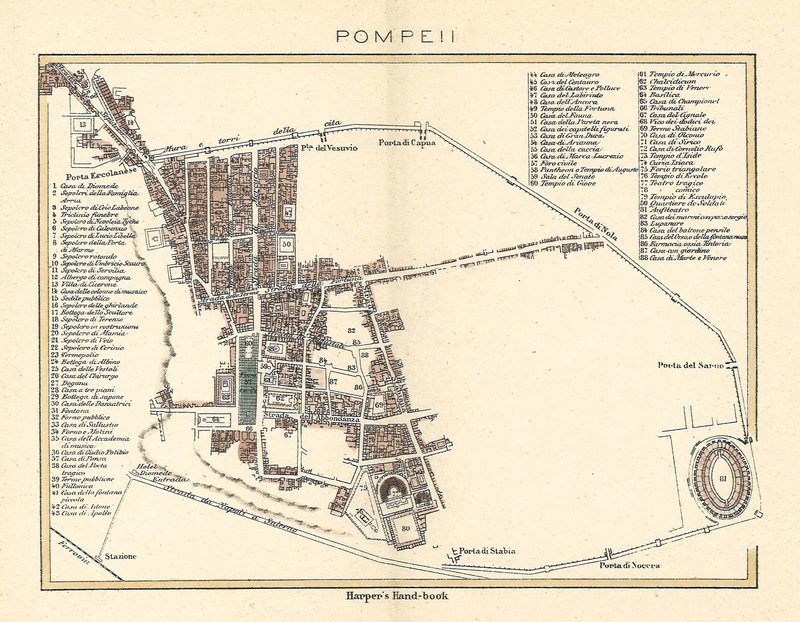 Maps, Plans and guides of Pompeii and surrounding area. Click on a thumbnail to see the larger version of that map. When this displays it will fit to the current size of your browser window. If there is more detail available then a further click on the image will enlarge it. Please note that to give more detail these larger images are much bigger than our usual size and so make take longer to load. If you have a plan which we could add to this page please email it to us, along with any details. Plan of Pompeii 1-4C AD from the Tabula Peutingeriana, 1-4th century CE. Facsimile edition by Conradi Millieri, 1887-1888. Wikimedia. 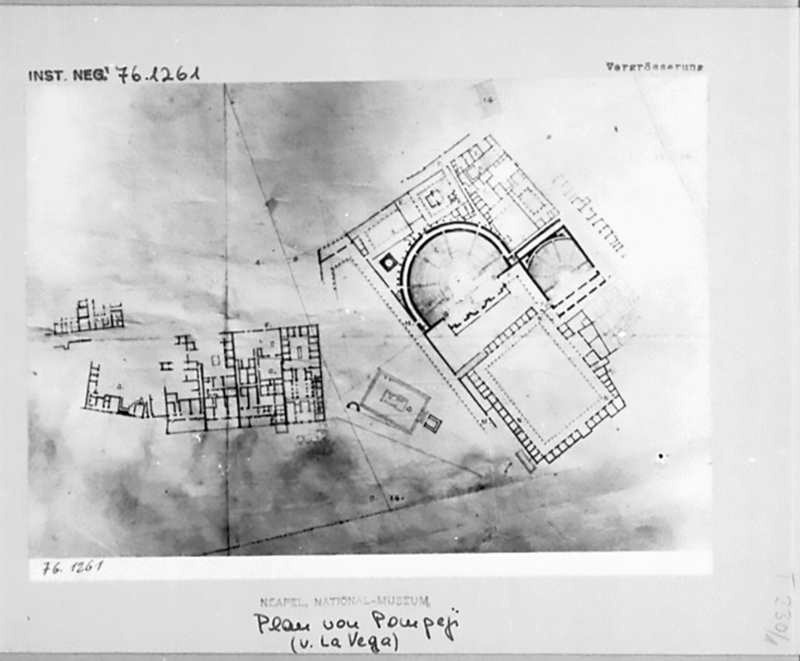 The first plan of Pompeii. 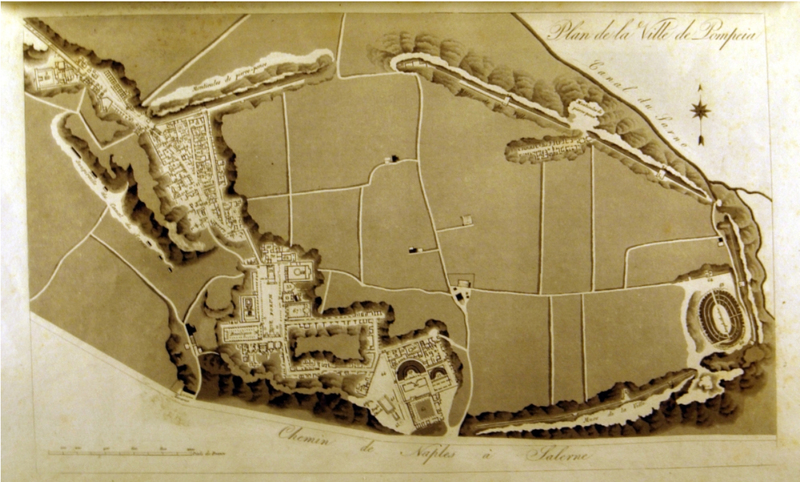 Sketch plan published in February 1776 by Francois-De-Paule Latapie. 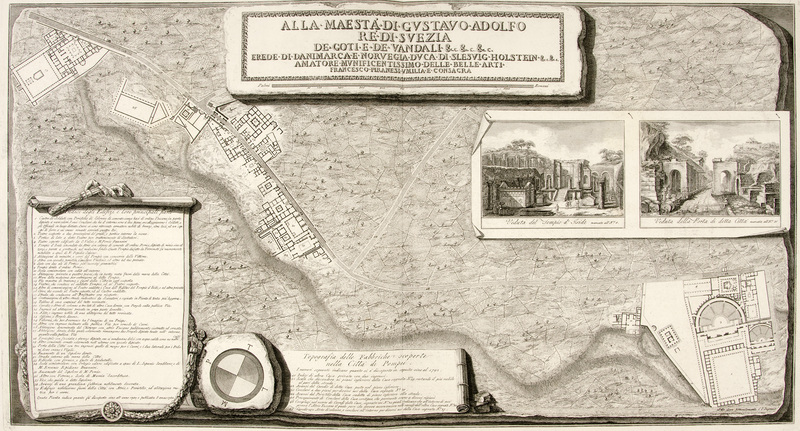 He drew the map from memory after visiting Pompeii, as such activities were not allowed during visits at that time, and made a presentation to l’Académie Reale di Scienzi, Lettere ed Arte de Bordeaux. There are several versions of this plan by F. Piranesi between 1785 - 1792 judging by the written key in the bottom left. This is the first we have. There are several versions of this plan by F. Piranesi between 1785 - 1792 judging by the written key in the bottom left. This is the second we have. 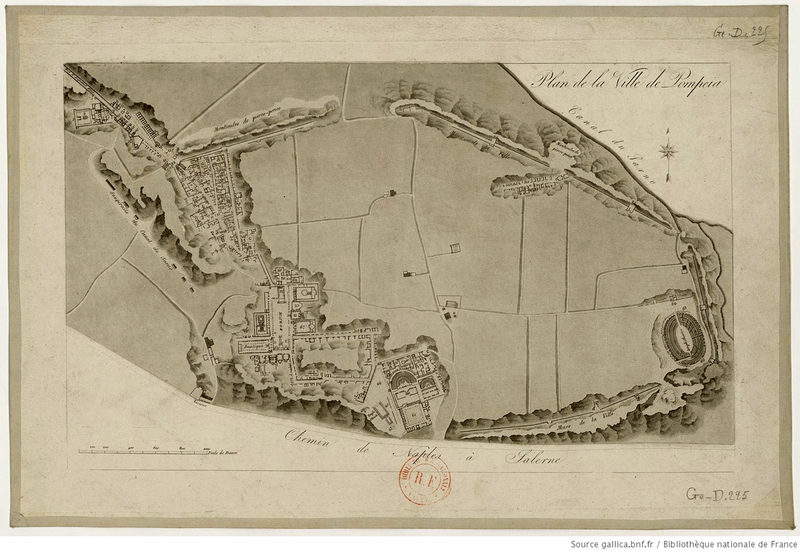 There are several versions of this plan by F. Piranesi between 1785 - 1792 judging by the written key in the bottom left. This is the third we have. There are several versions of this plan by F. Piranesi between 1785 - 1792 judging by the written key in the bottom left. This is the fourth we have. 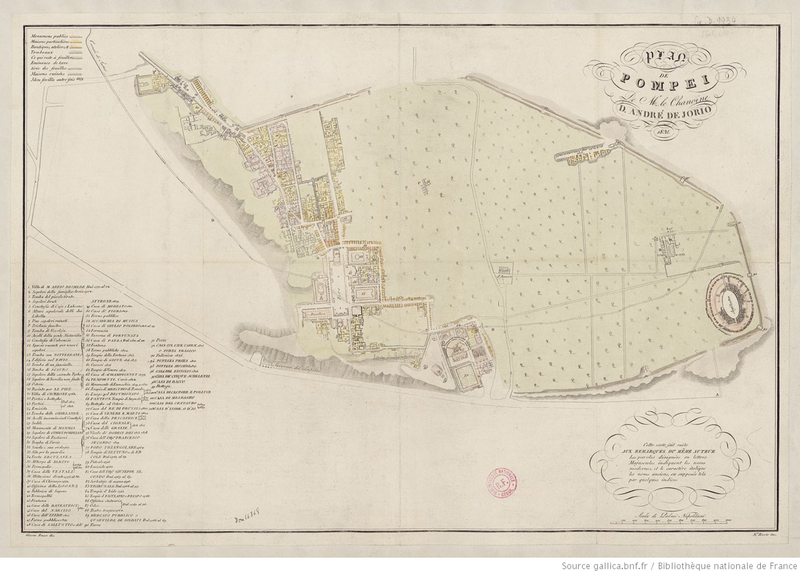 Pompeii plan of around 1800 to 1810 by Francesco La Vega (1737-1815). Photo courtesy of the Deutsches Archäologisches Institut. 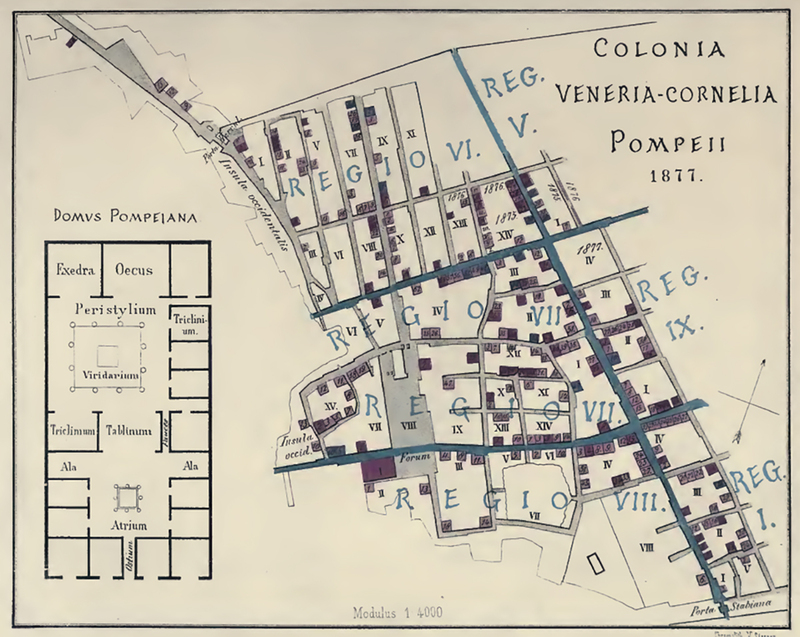 Undated plan of Pompeii. Possibly around 1800? Pompeii around 1800 to 1810. 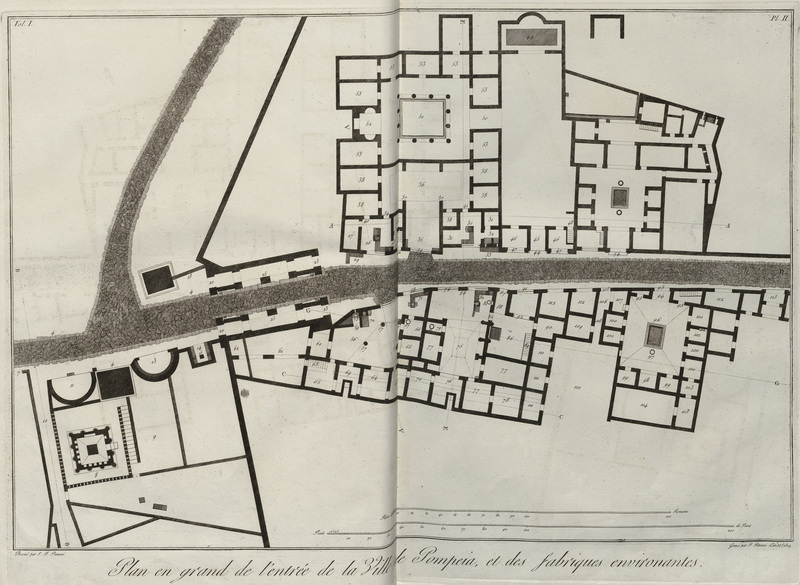 Detailed part of Pompeii plan of around 1800 to 1810 by Francesco La Vega (1737-1815). Photo courtesy of the Deutsches Archäologisches Institut. 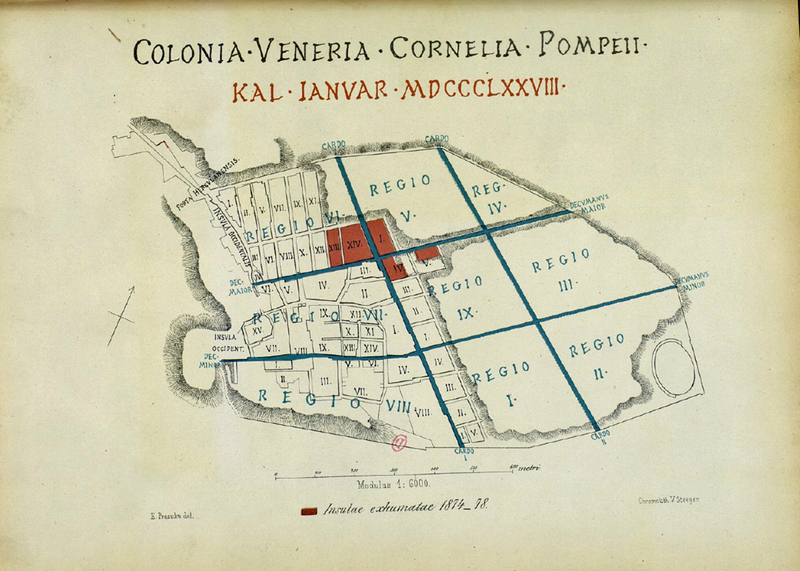 Index of Pompeii plan of around 1800 to 1810 by Francesco La Vega (1737-1815). Photo courtesy of the Deutsches Archäologisches Institut. 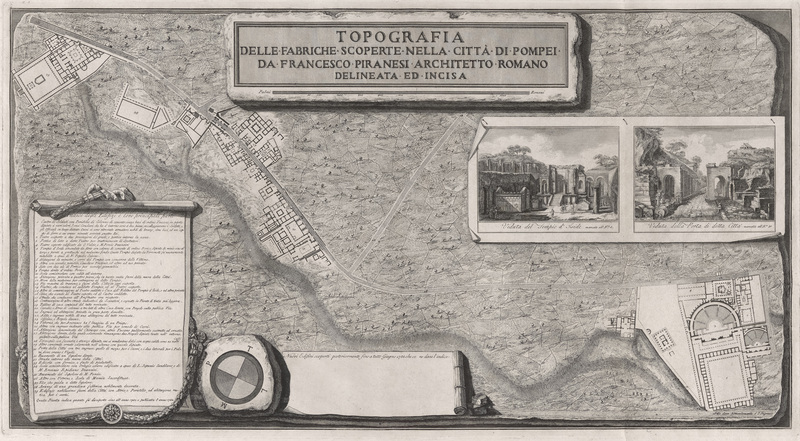 Plan showing entry to Pompeii and its surrounding remains by G. B. and F. Piranesi, 1804. 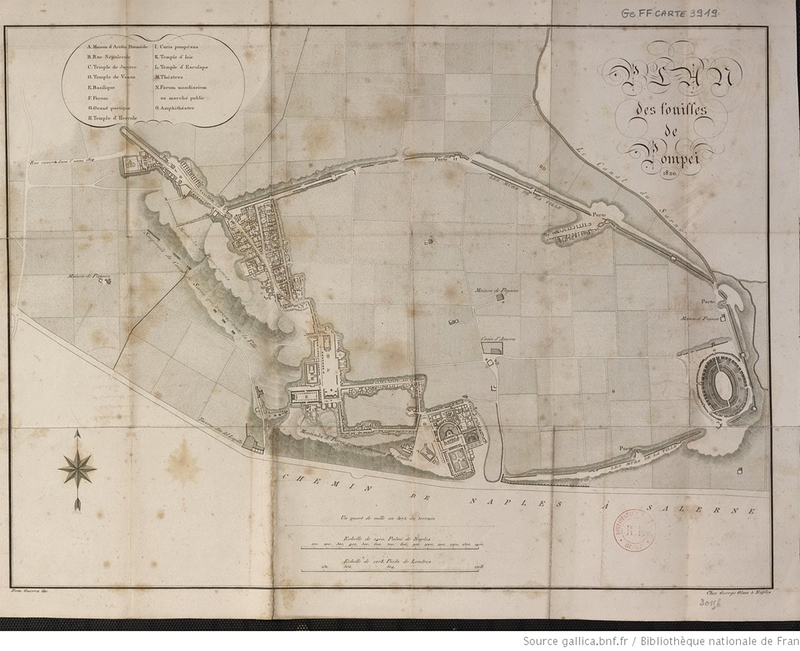 Plan of the land that covers the city of Pompeii drawn by Pasquale Scognamiglio, 1807. 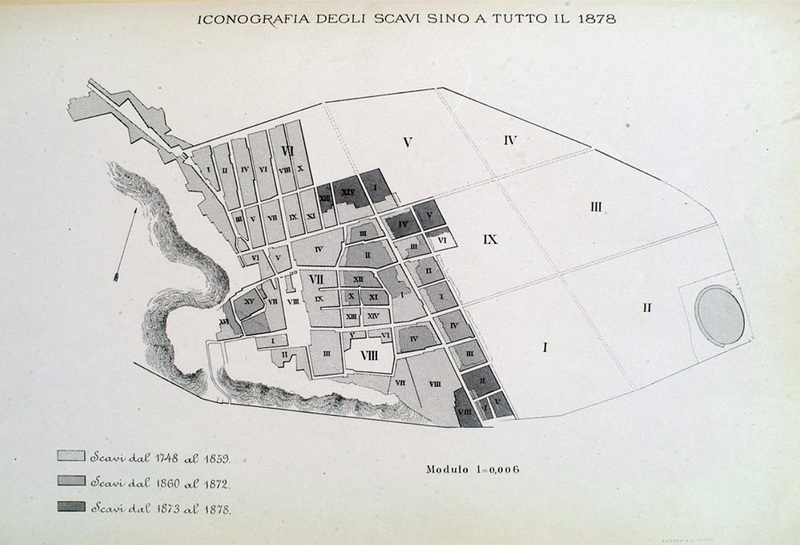 Redrawn plan, with clear numbers, of the land that covers the city of Pompeii on the plan drawn by Pasquale Scognamiglio, 1807. See Kockel V., Funde und Forschungen in den Vesuvstadten 1, Archäologischer Anzeiger, I985, p. 517, abb. 9. 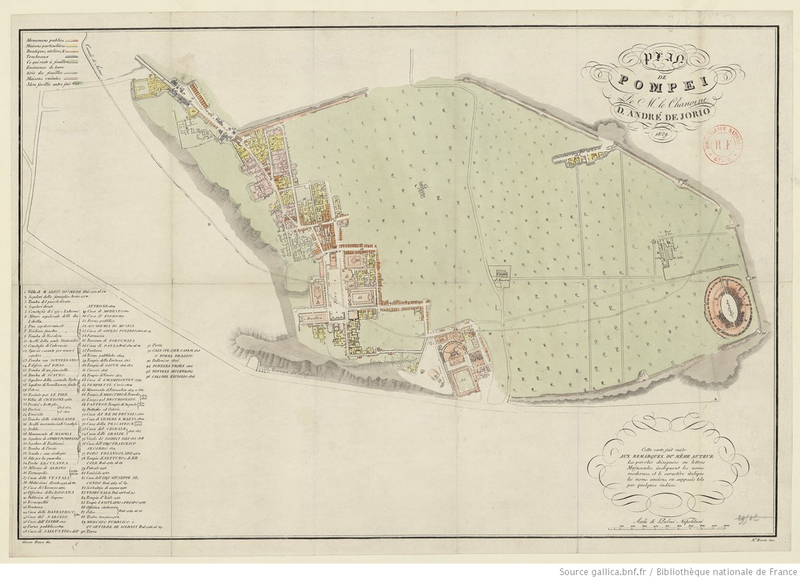 Undated plan of Pompeii possibly around 1800 to 1810? 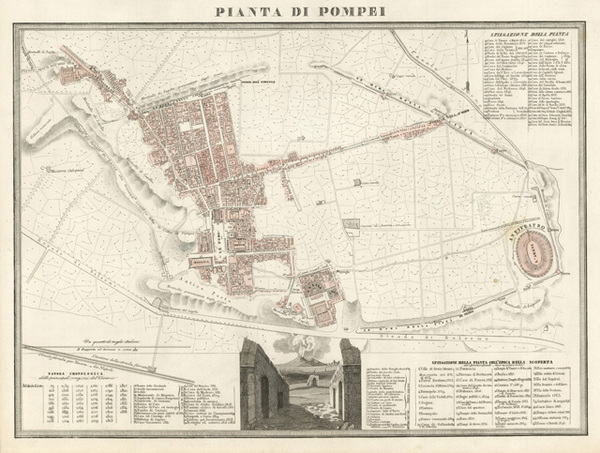 Map of Pompeii in 1810 also showing the Sarno Canal. Murray and Cooke Sept 1st 1810. 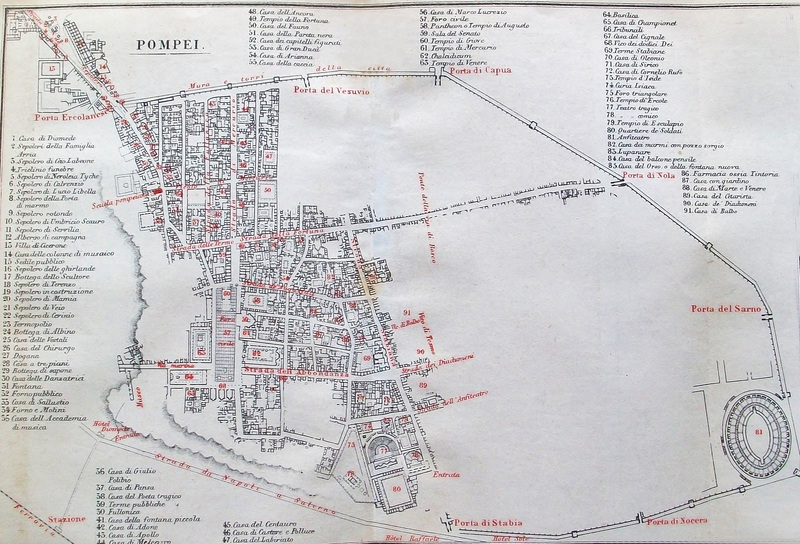 Map of Pompeii in 1811. From Romanelli, Viaggio a Pompei, 1811. 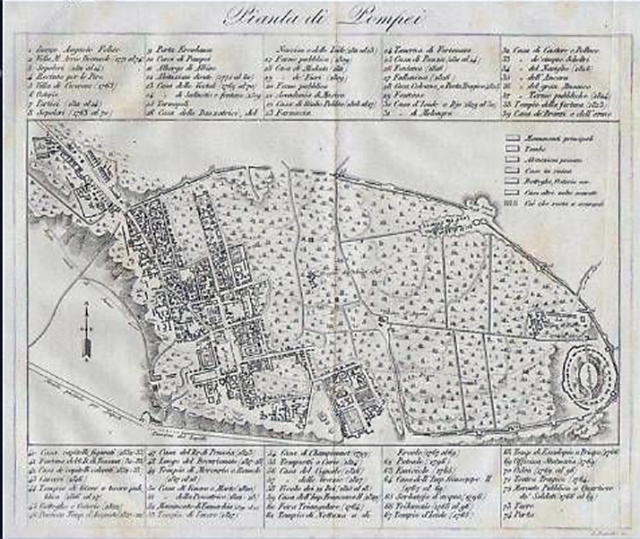 Plan of Pompeii in 1812 by Mazois. Published in Mazois F., 1824. Les Ruines de Pompei: Premiere Partie. Paris: Firmin Didot. pl. III. 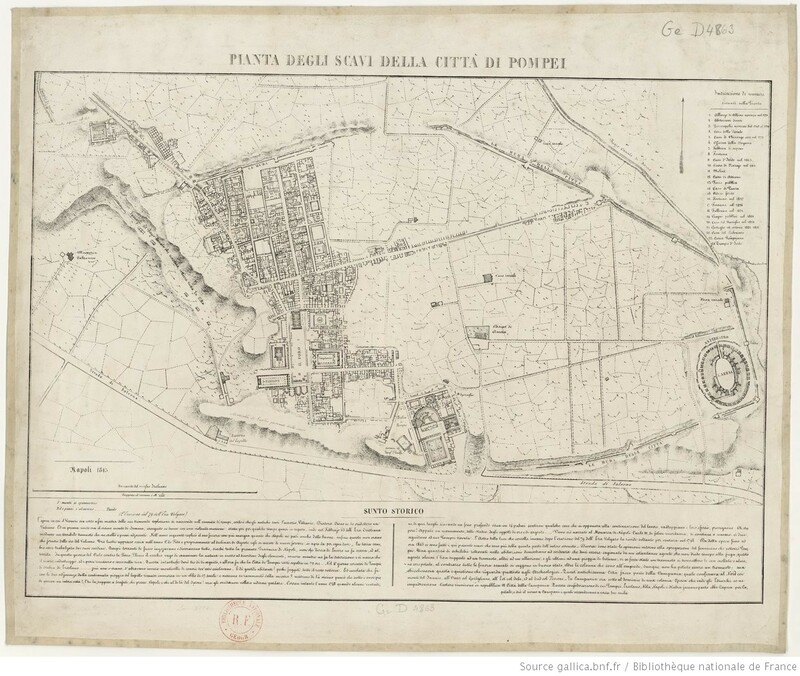 Plan of Pompeii in 1817 published in Gell and Gandy, Pompeiana, 1819 plate 1. 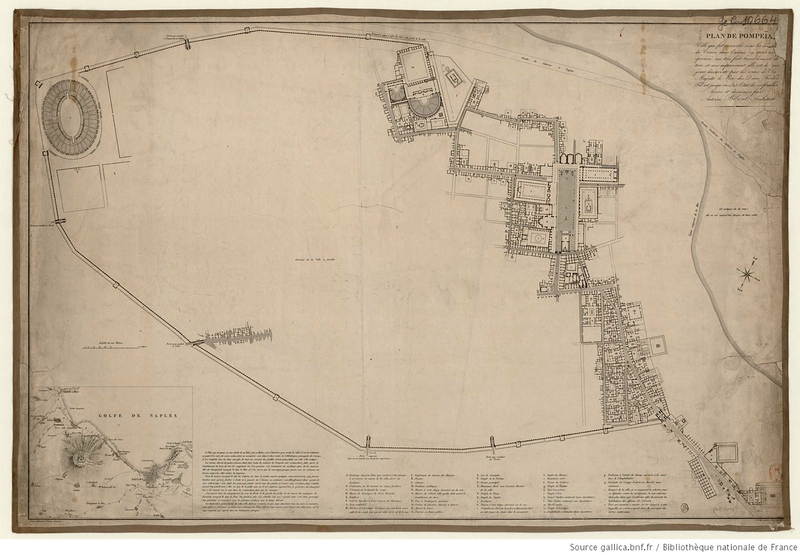 Plan of Pompeii 1819 showing excavations to that date. From Cooke Cockburn Donaldson, Pompeii, 1827 plate 2. 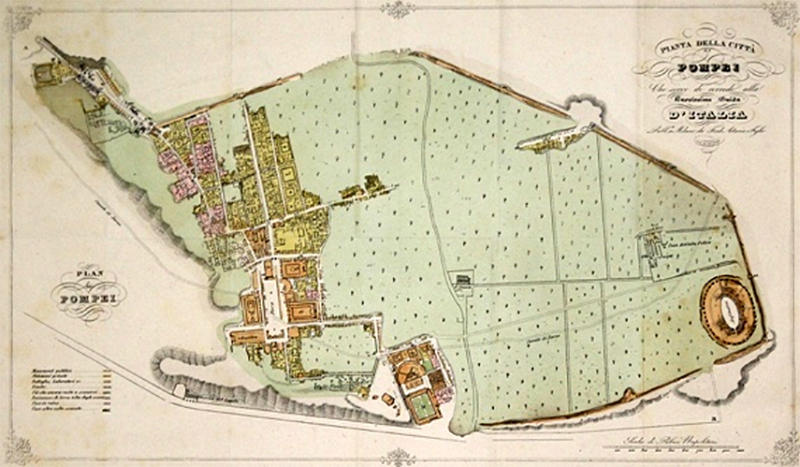 Plan of Pompeii in 1819 by Muller. 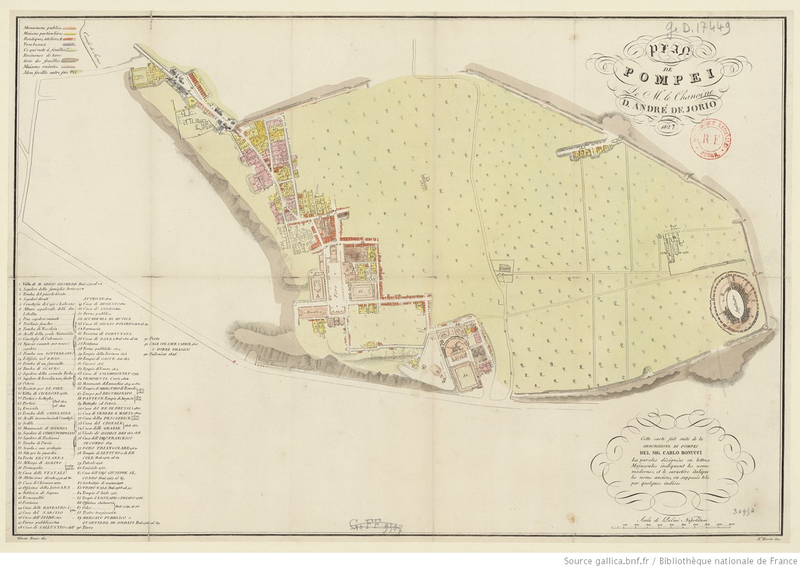 Plan of Pompeii in 1819 by H. Wilkins. Fold out plan produced in 1820 by George Glass of Naples. 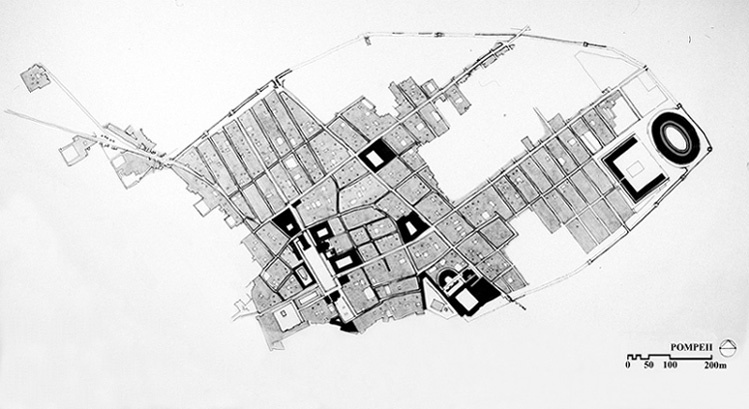 Plan of Pompeii in 1825 by Agyagfalva. 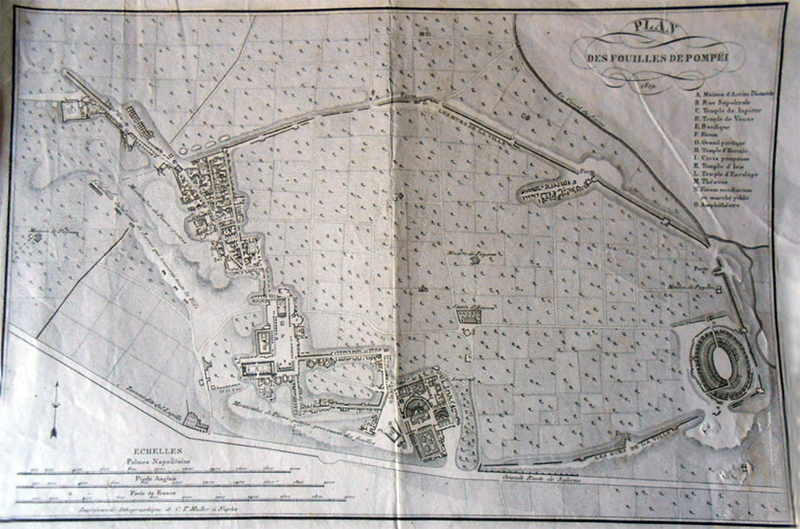 1825 plan by A. Bibent. 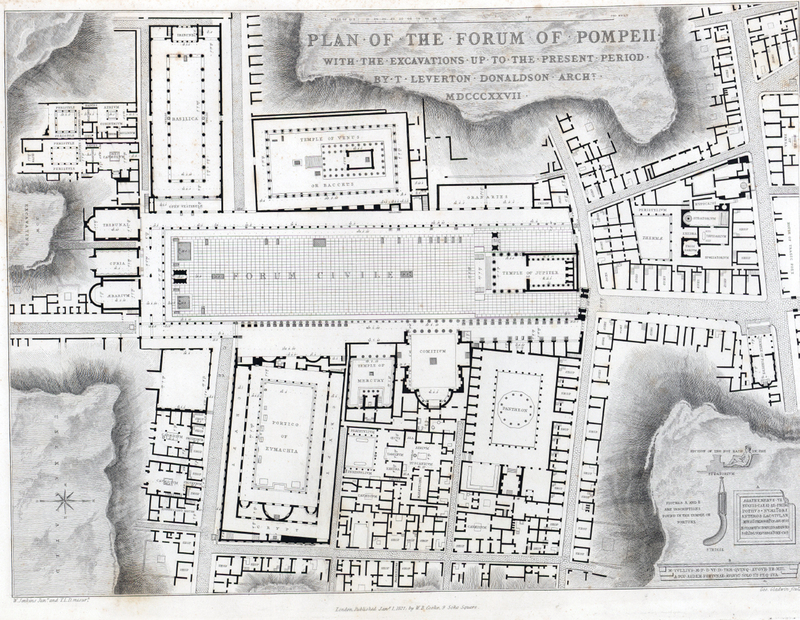 Plan of Pompeii Forum excavations to 1825. Cooke Coburn and Donaldson, Pompeii, 1827, part 1, plate 20. Plan of Pompeii in 1825 by A. de Jorio. 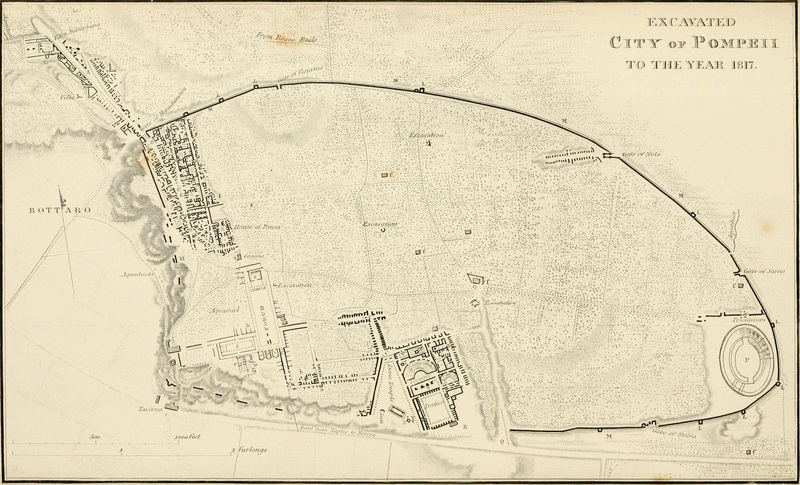 Plan of Pompeii Theatres and Triangular Forum excavations to 1825. Cooke Coburn and Donaldson, Pompeii, 1827, part 1, plate 14. 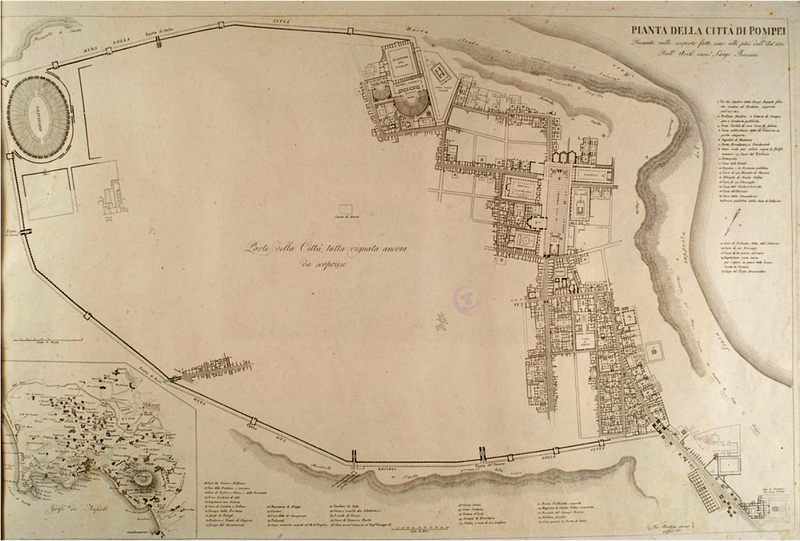 Plan of Pompeii in 1826 by A. Bibent. From Cooke, Cockburn, Donaldson, Pompeii, 1827 part 1, plate 3. Plan of Pompeii in 1826 by Cuciniello and Bianco. 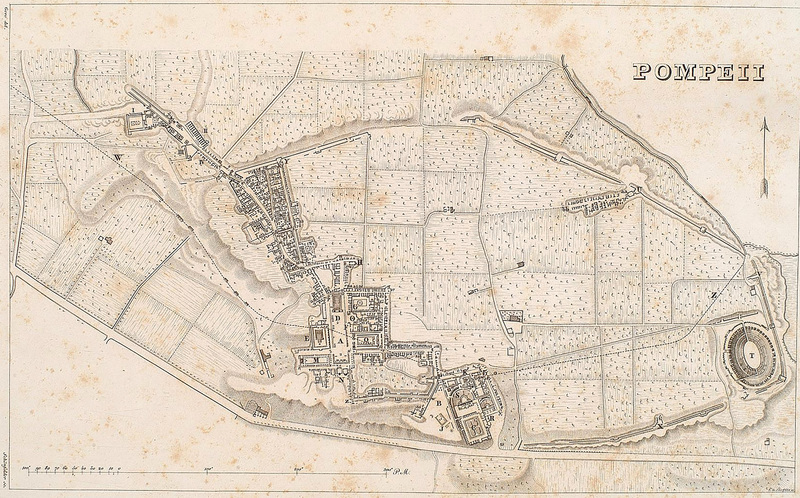 Plan of Pompeii in 1827 by P. Fumagalli, published in 1876. Plan of Pompeii in 1827 by A. de Jorio. Plan of Pompeii in 1828 by Zahn. 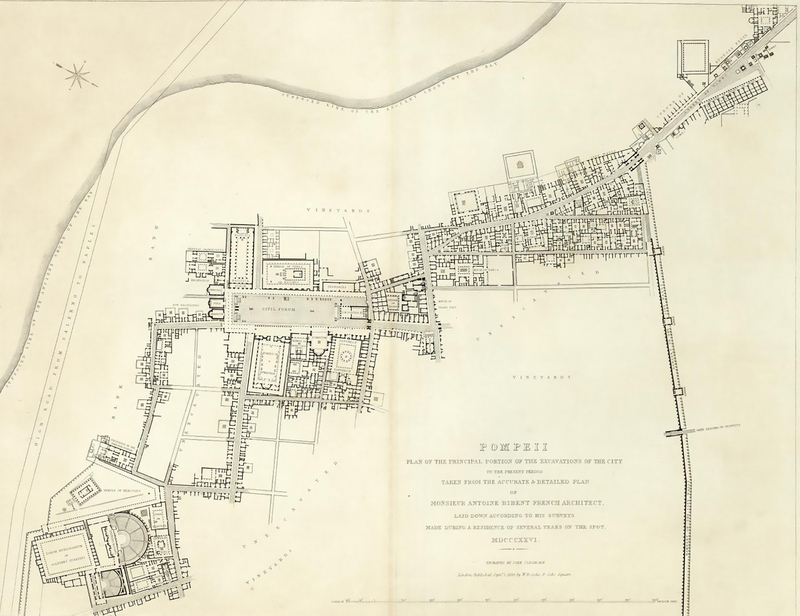 Plan of Pompeii published in 1828 in Views of Pompeii drawn on stone, by J D Harding, after drawings by William Light. Plan of Pompeii in 1829 by A. de Jorio. 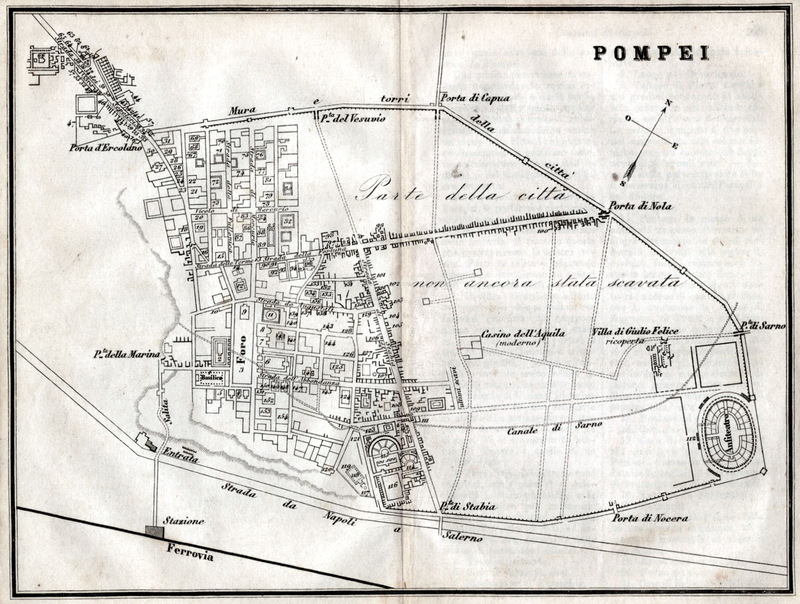 Plan of Pompeii in 1830 by Fumagalli. Plan of the Street of Tombs, Villa of Diomedes and Cicero in Pompeii in 1830 by Fumagalli. Plan of Pompeii in 1831 by A. de Jorio. 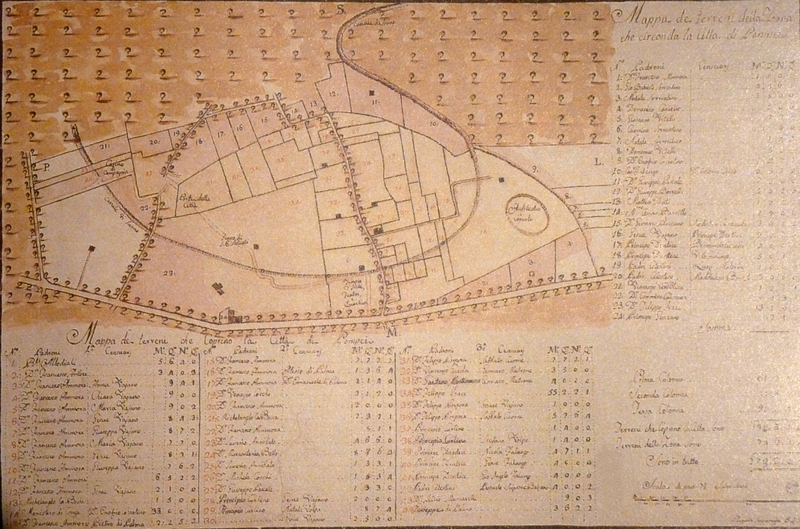 Plan of Pompeii in 1831 by L. Rossini. 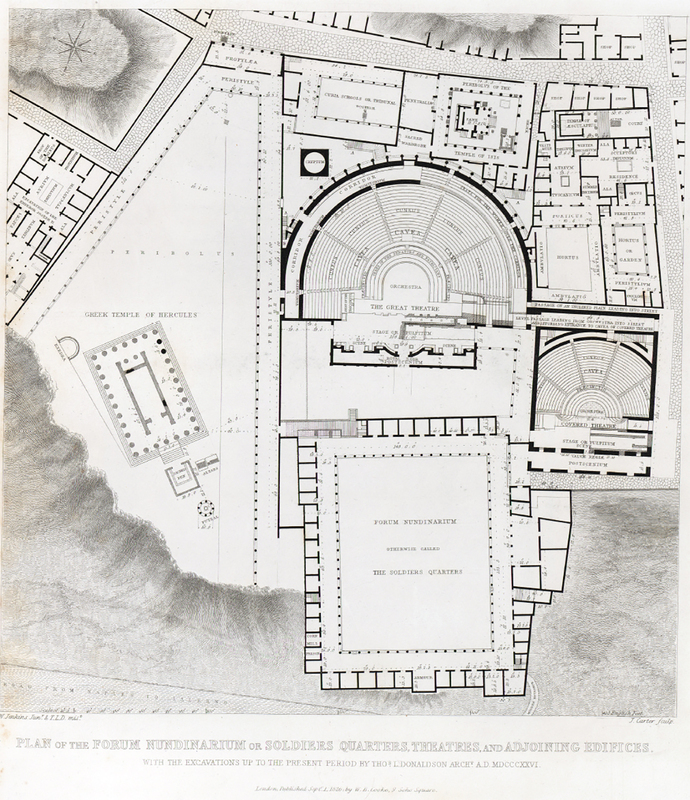 Plan of Pompeii in 1832 by Baldwin and Cradock for the Society for the Diffusion of Useful Knowledge. From Wikimedia. 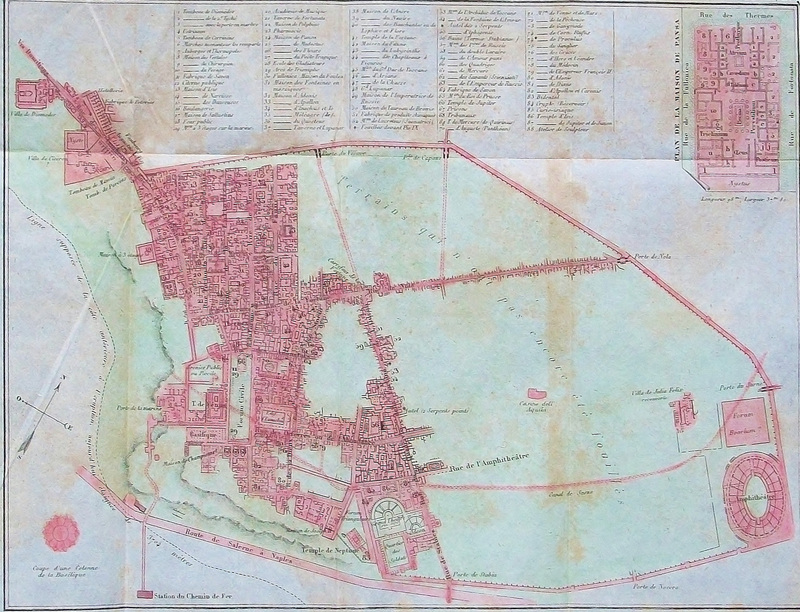 Plan of Pompeii in 1833 by Giosuè Russo, with the different colouring of the progress of the excavations marked. 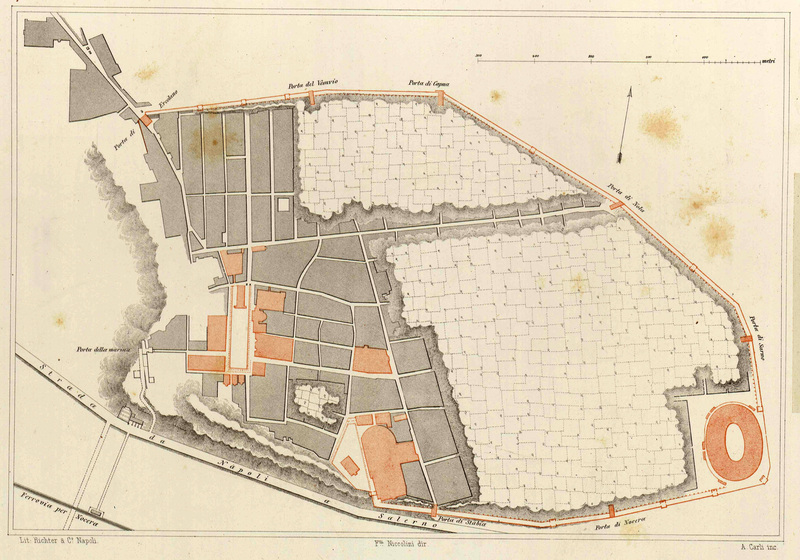 Plan of Pompeii in 1834, published by Auton in 1837. 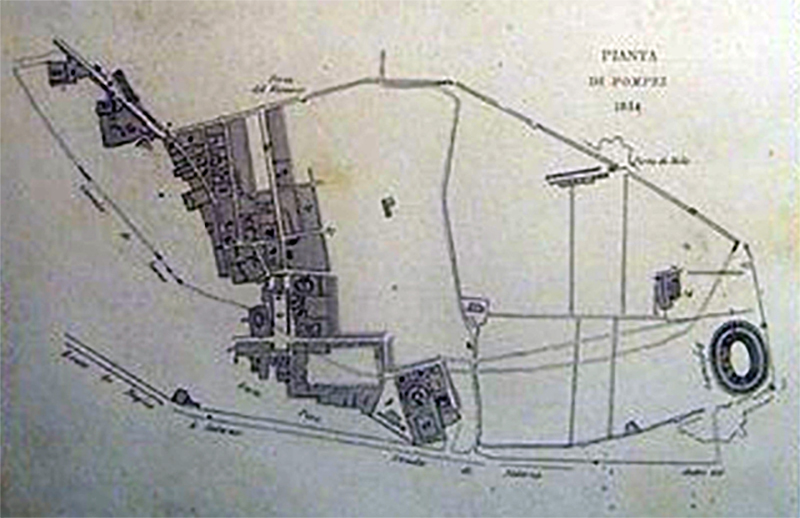 Plan Pompeii in 1839 by Ferdinando Artaria. Plan of Pompeii in 1839 by A. de Jorio. 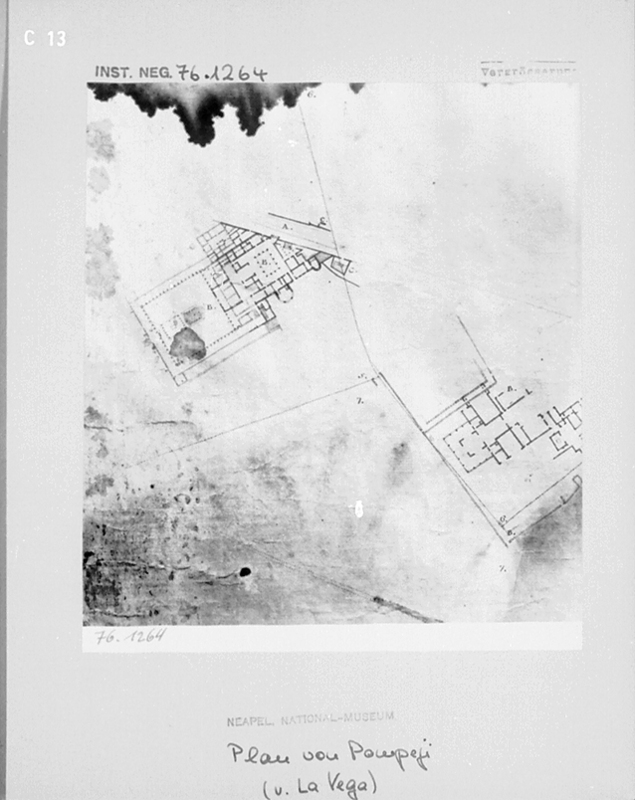 Plan of Pompeii by F. Neymiller. Published in Zucoli L., Ed., 1844. 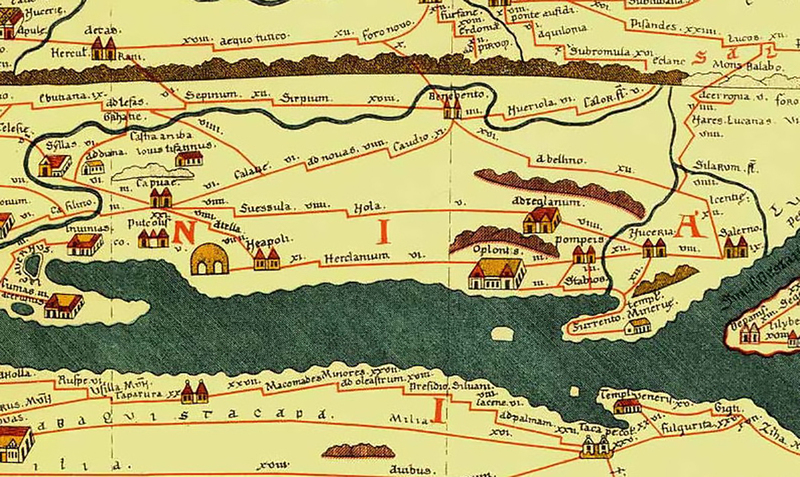 Nuovissima Guida dei viaggiatori in Italia e nelle principali parti d'Europa, 2nd Ed. p. 271. 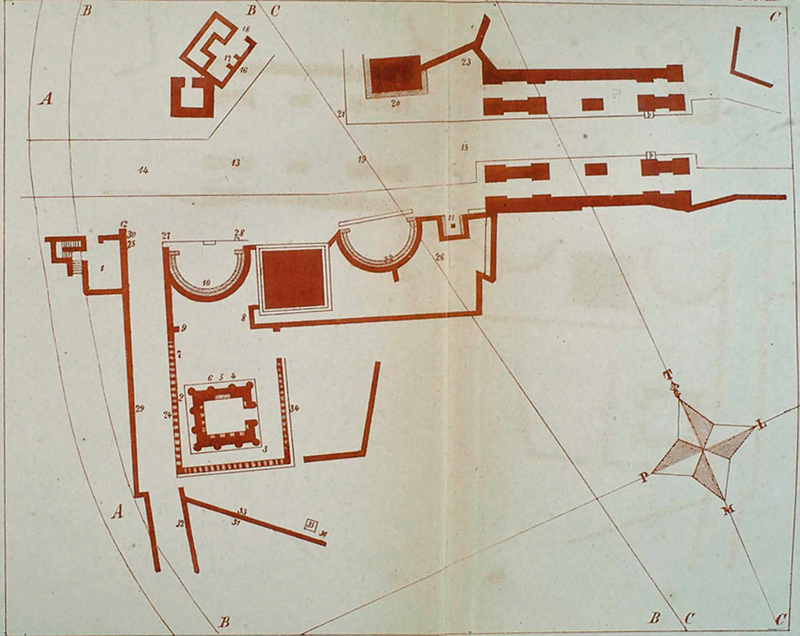 Plan of Pompeii in 1841 by Ferdinando Artaria. 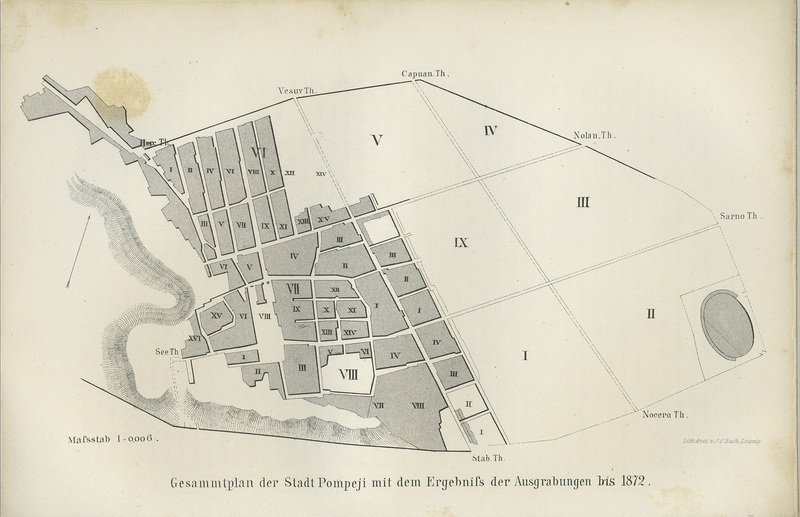 Plan of Pompeii in 1843 by J. Engelhard. 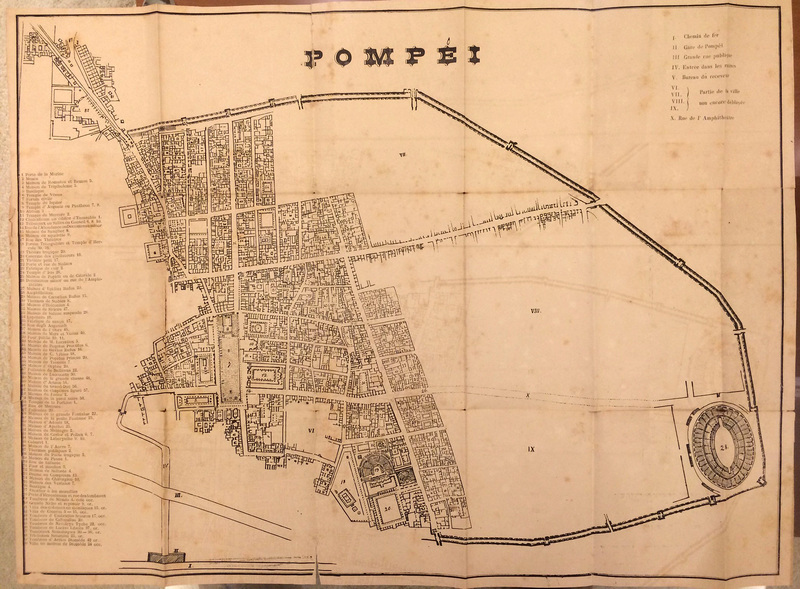 1843 or 1845 plan of Pompeii, (the date is unclear on the plan). 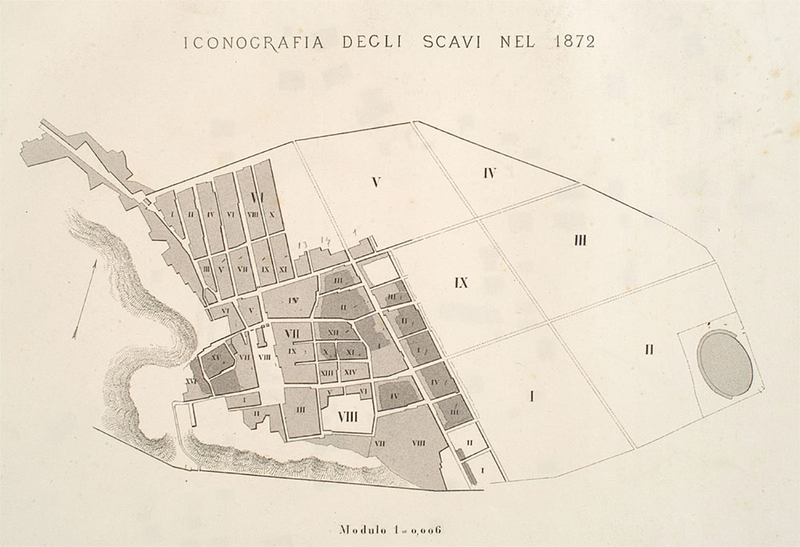 Plan of Pompeii in 1845 by Bonucci. 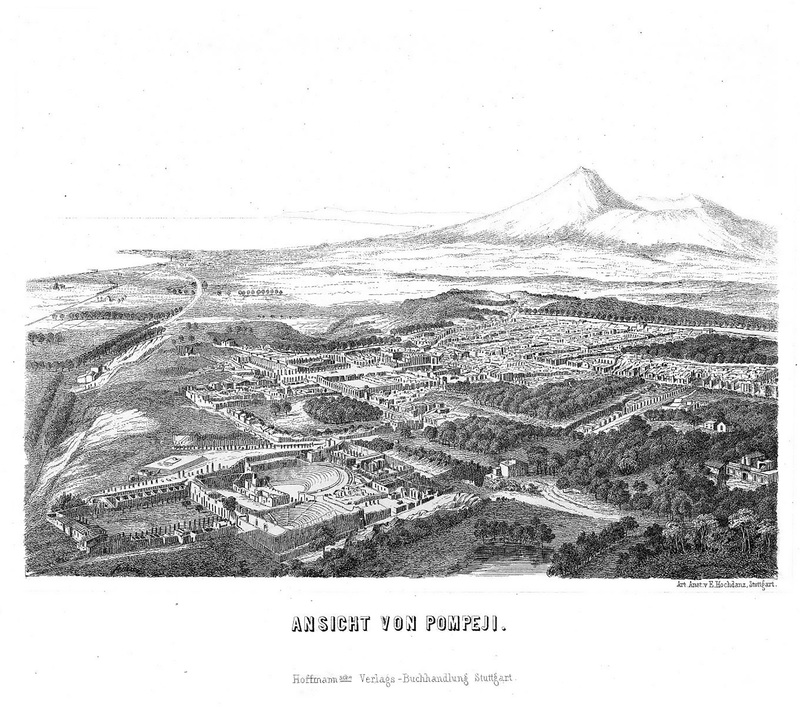 A birds eye view of Pompeii in a lithograph dated 1848 by Emil Hochdanz. Possibly based on a balloon flight. 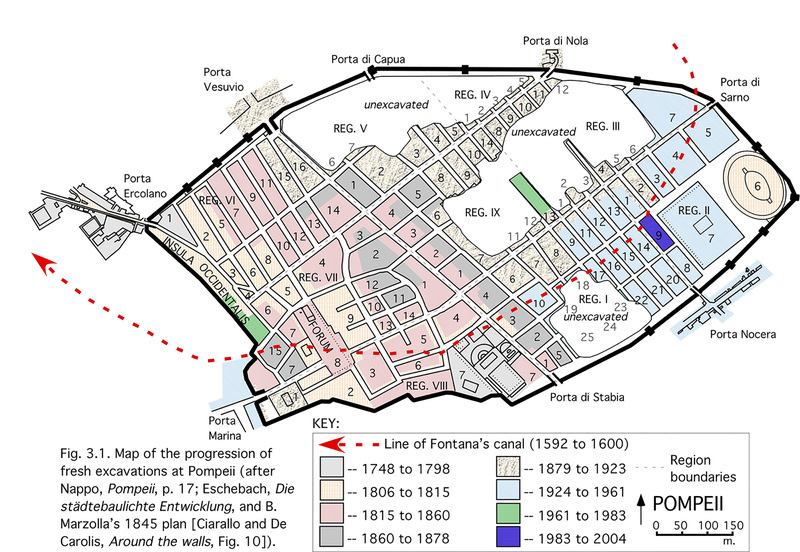 It shows the old spur and approach to Pompeii near the Forum and Porta Marina. You can also see the original train line running along to the left. Photo courtesy of Rick Bauer. 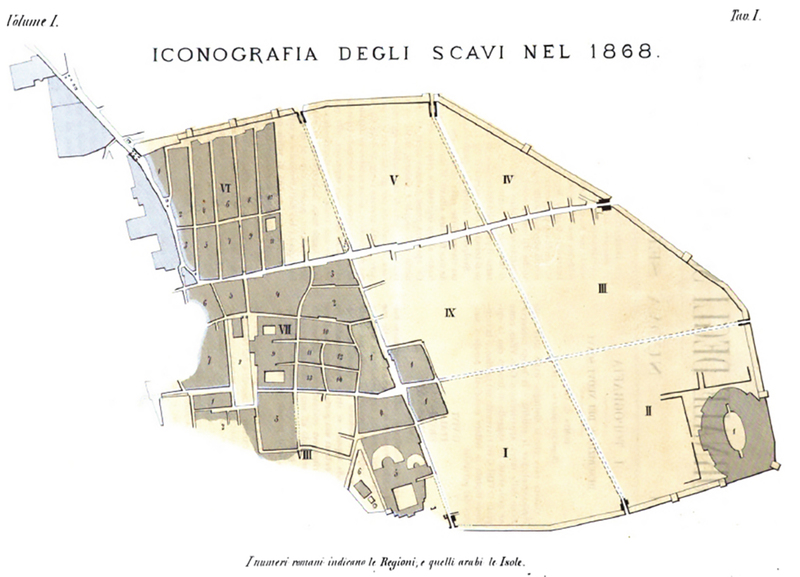 Plan of Pompeii in 1848 by Bonucci. Plan of Pompeii in 1851 by D'Aloe S., 1851. Les Ruines de Pompei. 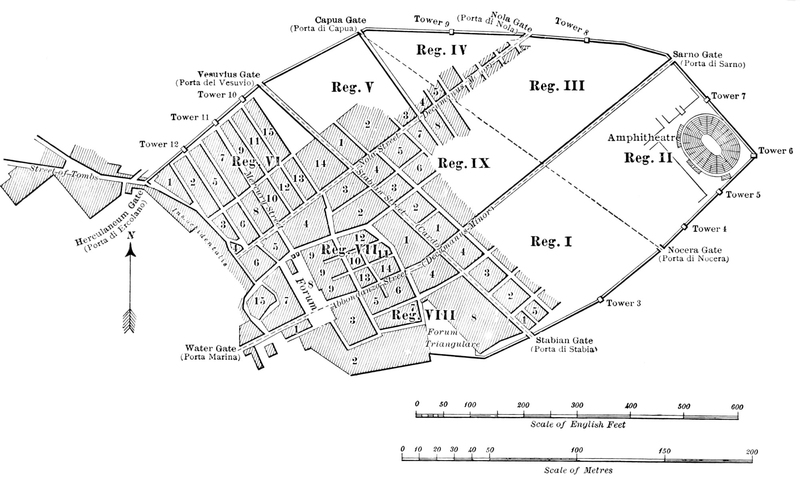 Plan of Pompeii showing excavations from 1748 to 1844. Published by Zahn in 1852. 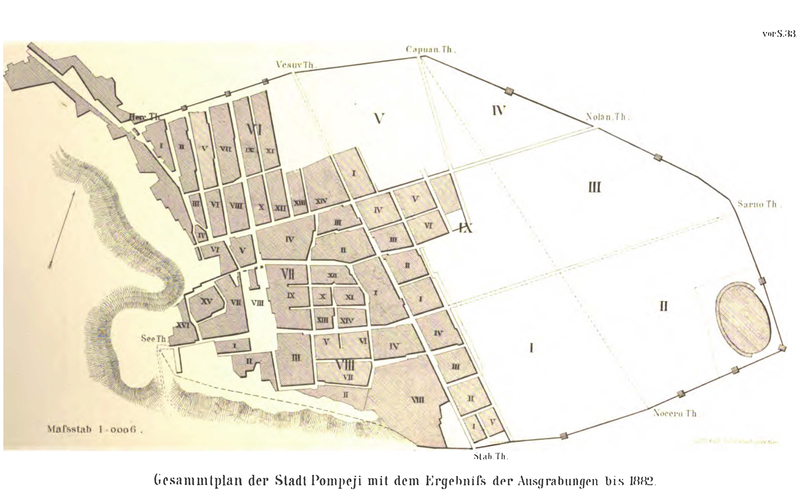 Plan of Pompeii excavations from 1754-1855 by J. G. Bach. Published by Overbeck in 1855. 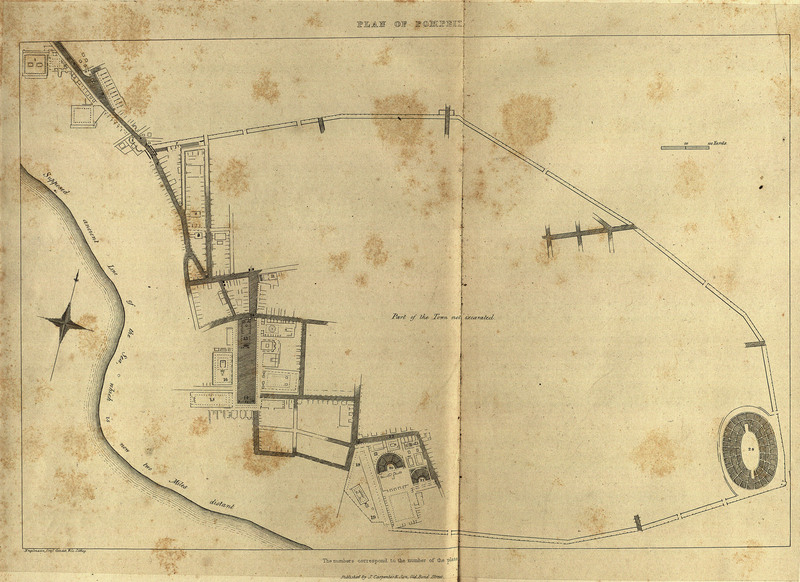 Plan of Pompeii in 1856, d-apres les dernieres fouilles, by A. H. Dufour. 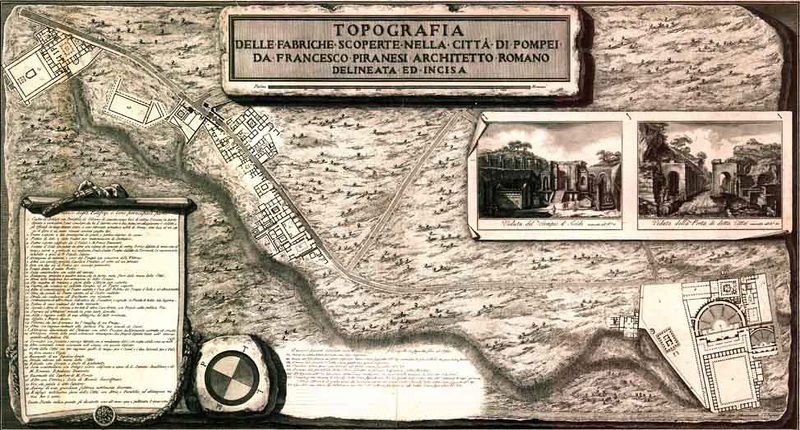 Fiorelli and Sorgente produced a plan of Pompei in 1859. 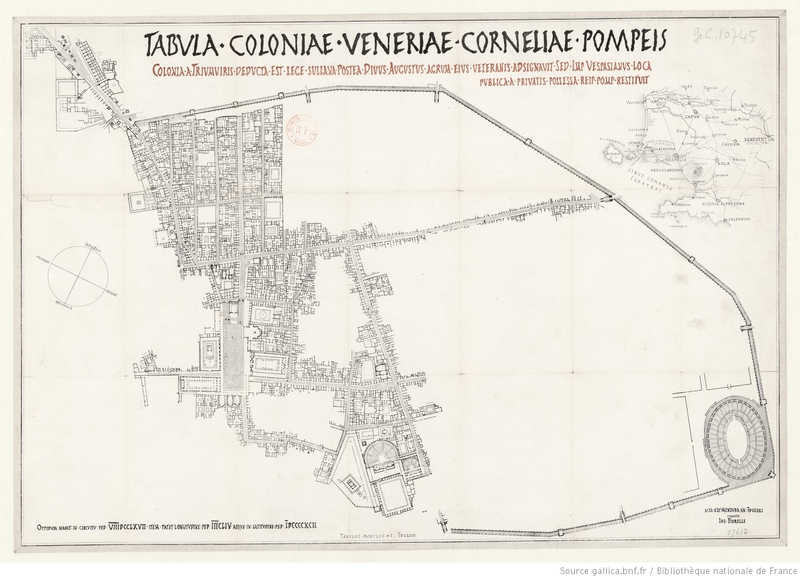 Tabula coloniae Veneriae Corneliae Pompeis consists of 42 plates. 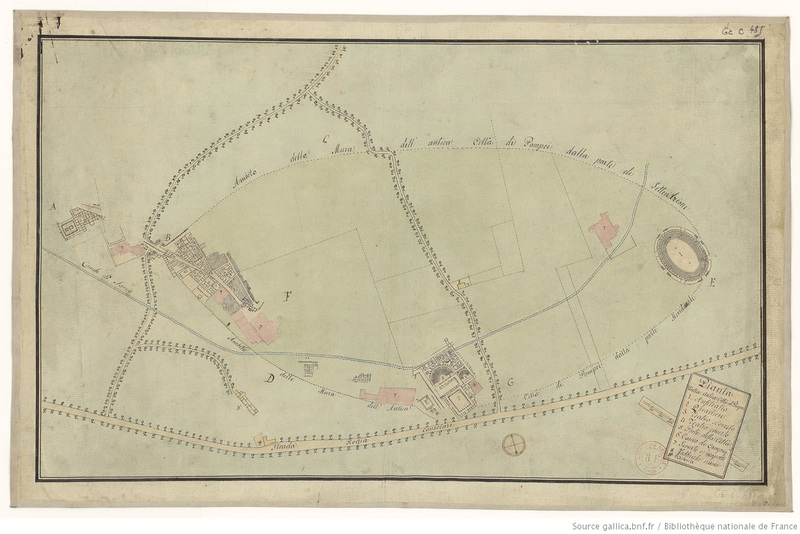 Our summary plan is from 1861, courtesy of Gallica.bnf.fr. 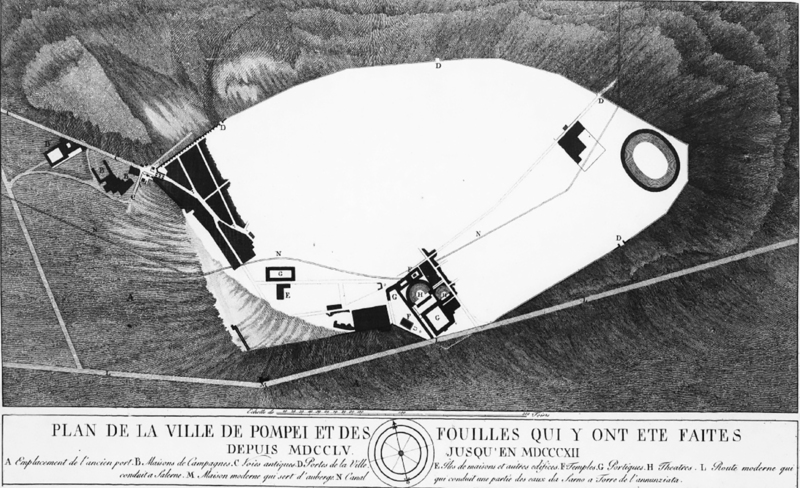 Plan of Pompeii in 1859, d-apres les dernieres fouilles, by A. H. Dufour. Nuovo pianta degli scavi di Pompei 1860. Photo courtesy of Gallica.bnf.fr. 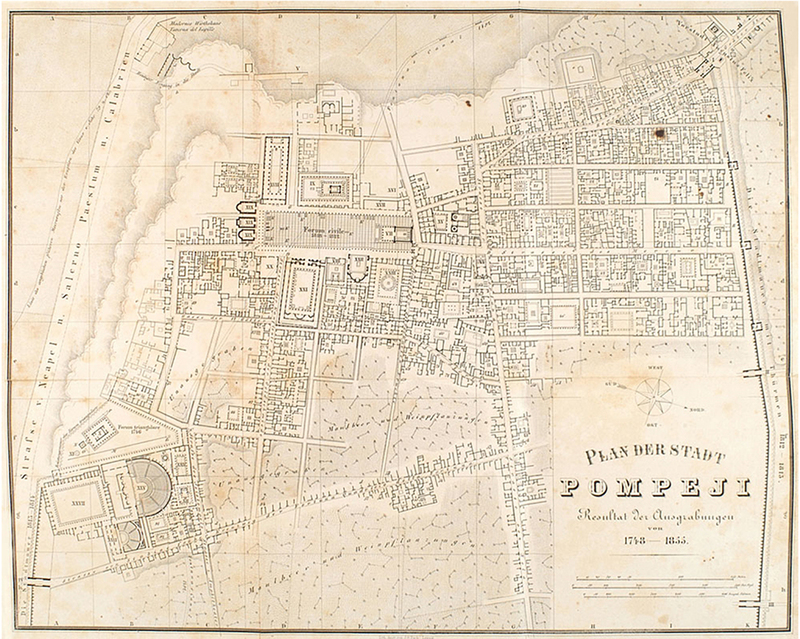 Plan of Pompeii in 1860. 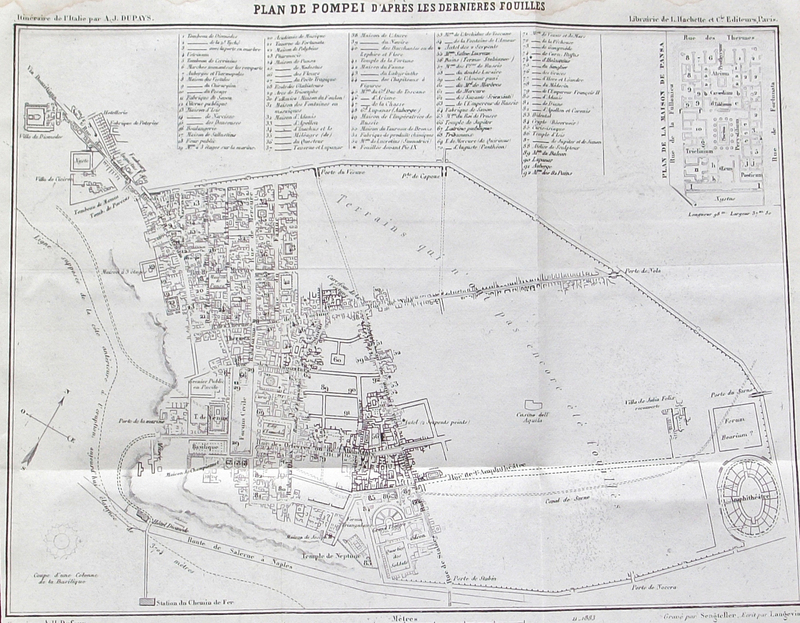 Plan of Pompeii in 1863, d-apres les dernieres fouilles, by A. H. Dufour. 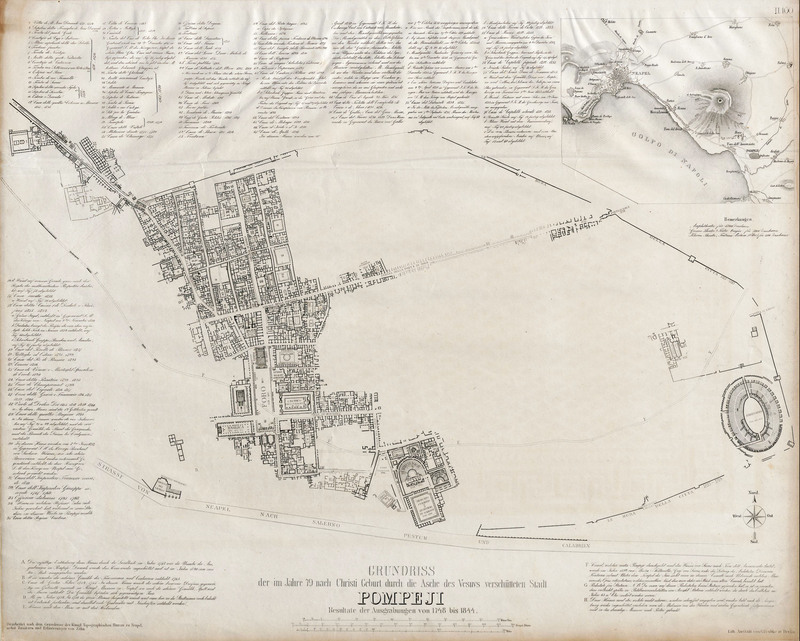 Dutch Plan of Pompeii in 1864 by J. J. C. de Wijs. Published in Bouwkundige Bijdragen, Deel 17, 1870. Photo Wikimedia. 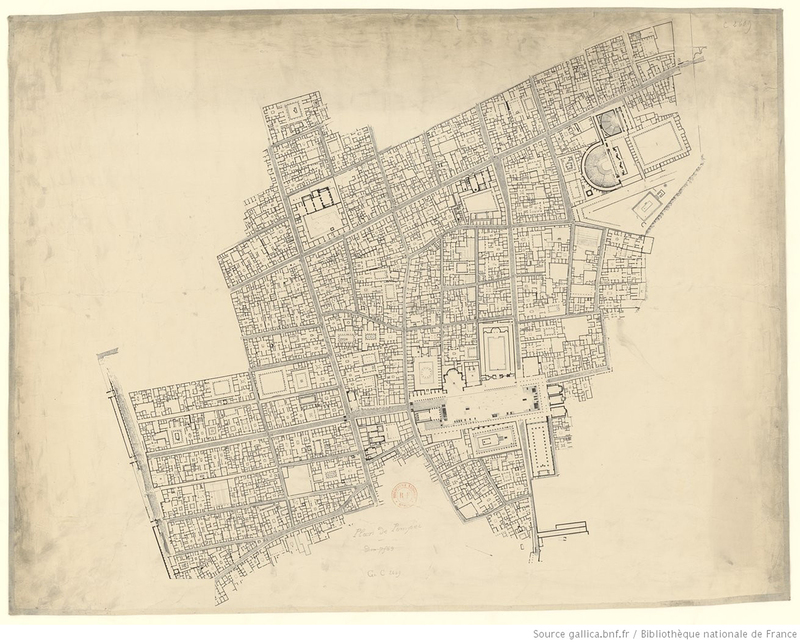 Plan of Pompeii in 1865 from Karl von Spruner’s 1865 rendering of Southern Italy and Sicily in antiquity. Photo Wikimedia. 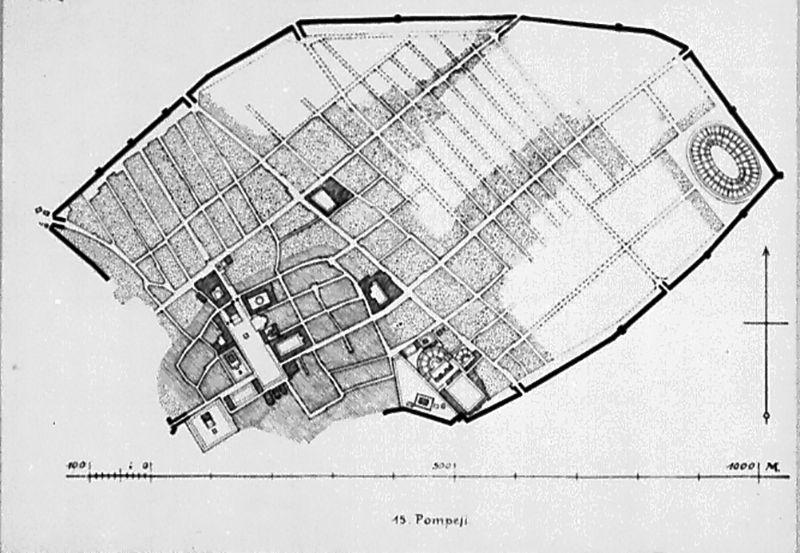 Plan of Pompeii in 1865 by Wagner. 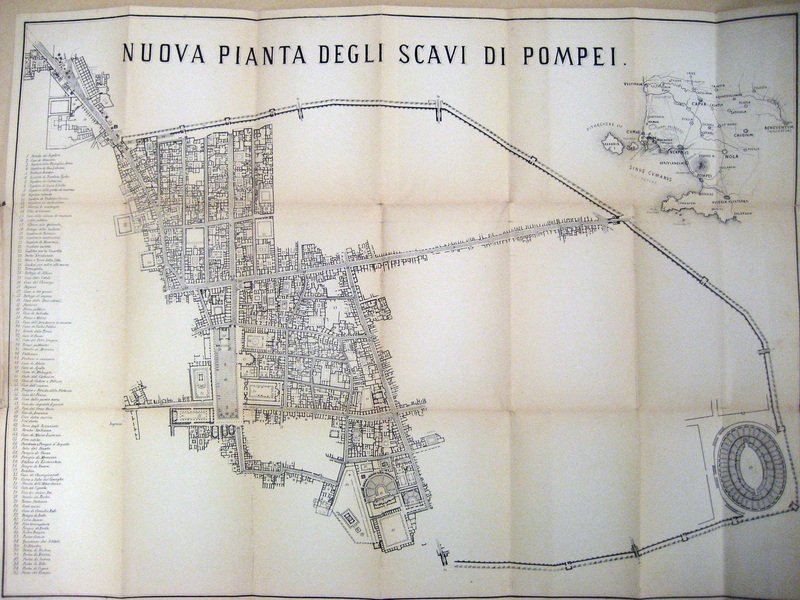 Plan of Pompeii in 1866 by D'Aloe. 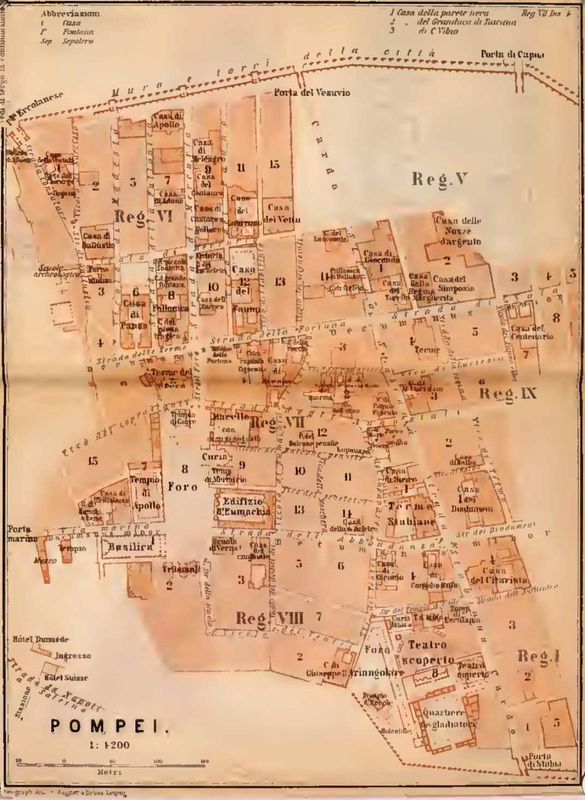 Plan of Pompeii in 1867 from C. I. L. IV, volume 1. 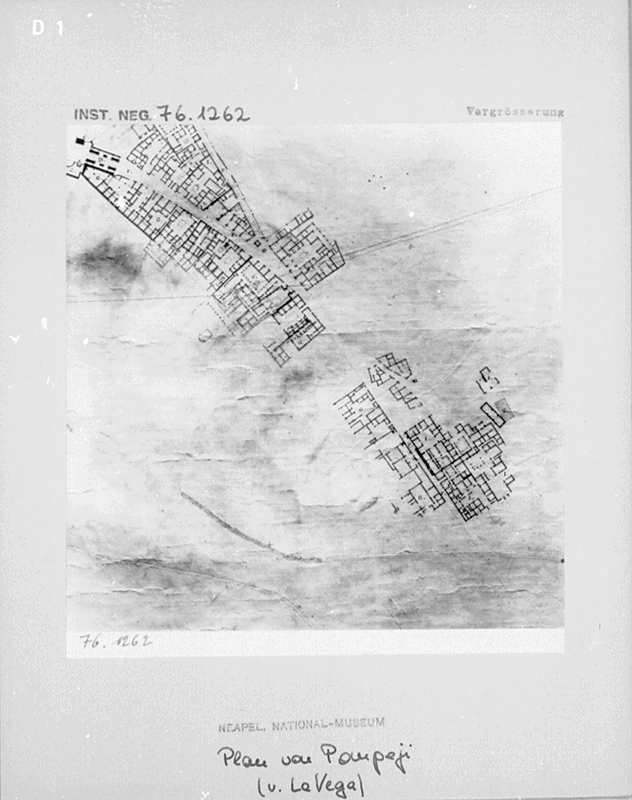 Plan of Pompeii 1868 by Fiorelli. Giornale degli scavi, NS1, 1868, Tav. 1. 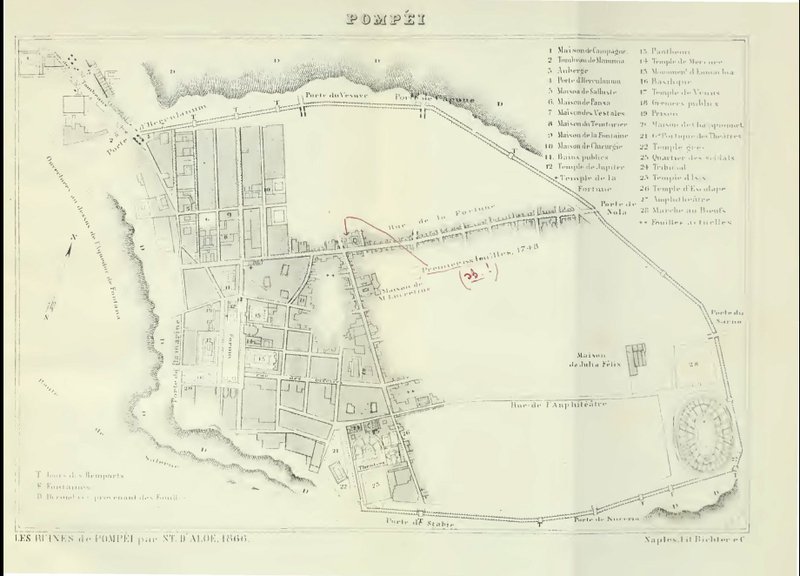 Plan of Pompeii in 1869 by E. Breton. 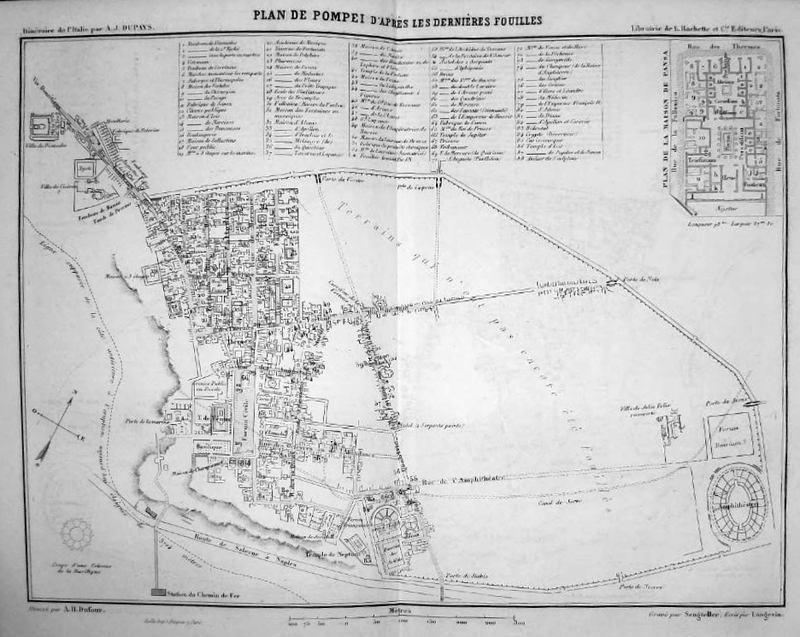 Plan of Pompeii in 1869, d-apres les dernieres fouilles, by A. H. Dufour. Nuovo pianta degli scavi di Pompei, 1870. Photo courtesy of Gallica.bnf.fr. Plan from Baedeckers handbook c. 1870's. Courtesy of Rick Bauer. 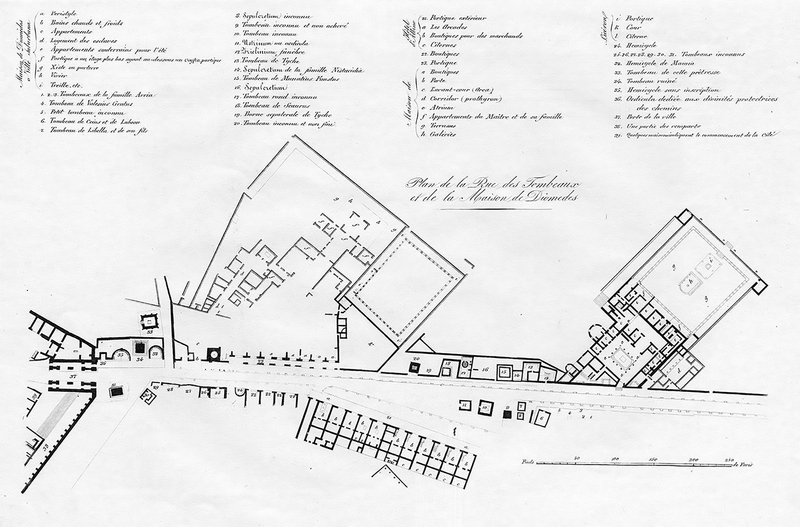 Plan of Pompeii in 1871 by Ferdinando Artaria. 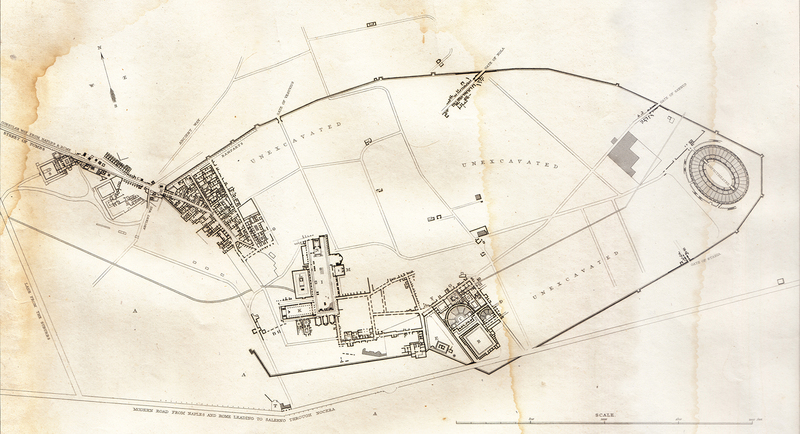 Plan of Pompeii in 1871 by Dyer, showing the excavated portion reduced from Fiorelli. Photo courtesy of Rick Bauer. 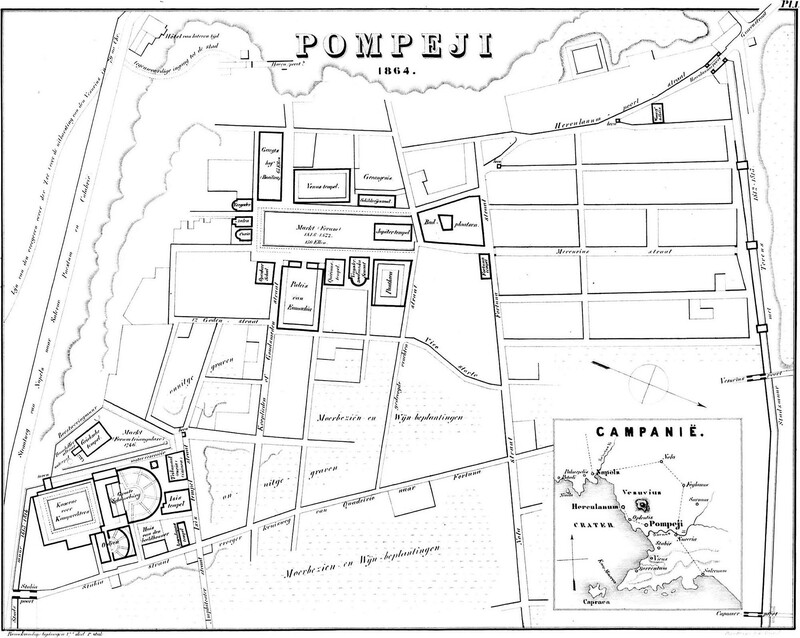 Plan of Pompeii in 1872 by Fiorelli. From Gli scavi di Pompei dal 1861 al 1872, tav. 1. Plan from Harper's Hand-Book of c. 1870's, possibly 1872 Courtesy of Rick Bauer. 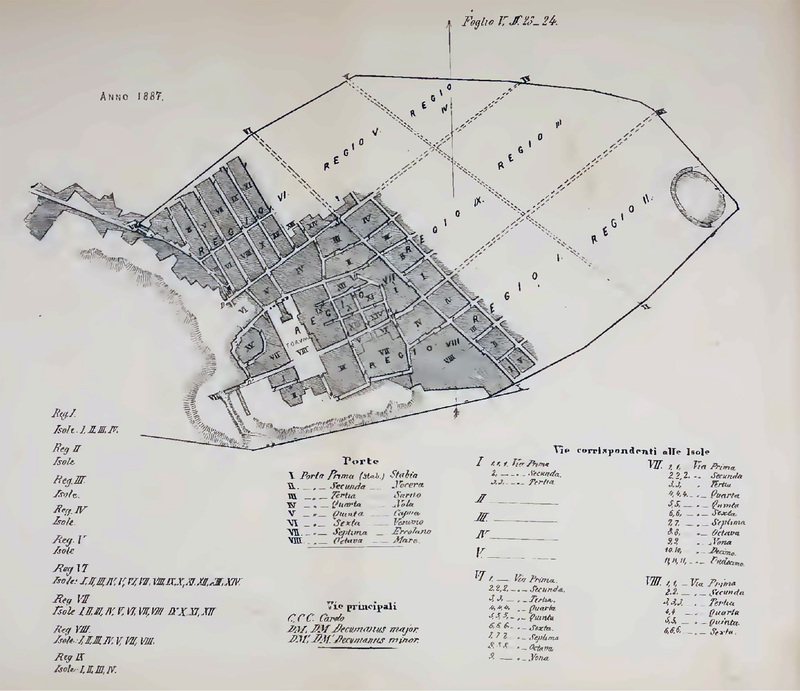 Gesamtplan der Stadt Pompeji mit dem Ergebnis der Ausgrabungen bis 1872. 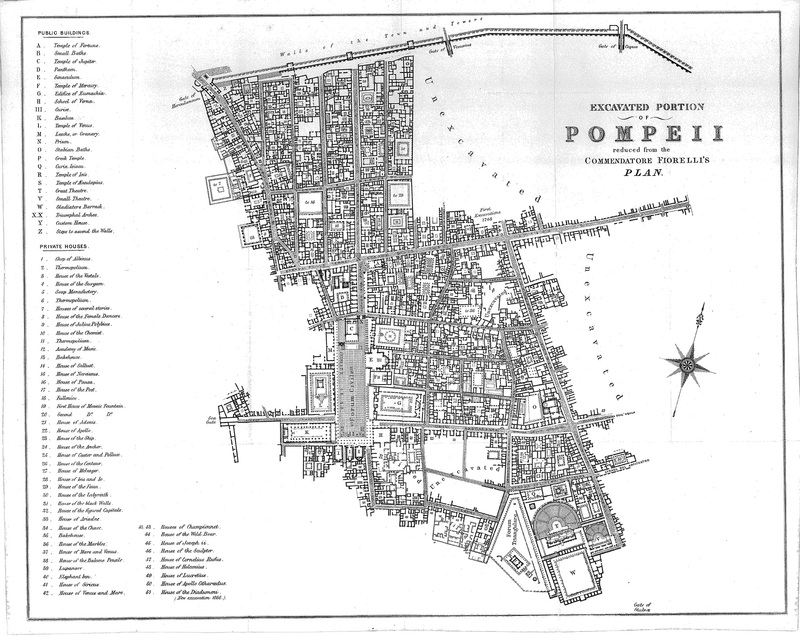 Overall plan of the city of Pompeii with the result of the excavations until 1872. See Overbeck J. Pompeji in seinen Gebauden Alterthumen und Kunstwerken 1875. 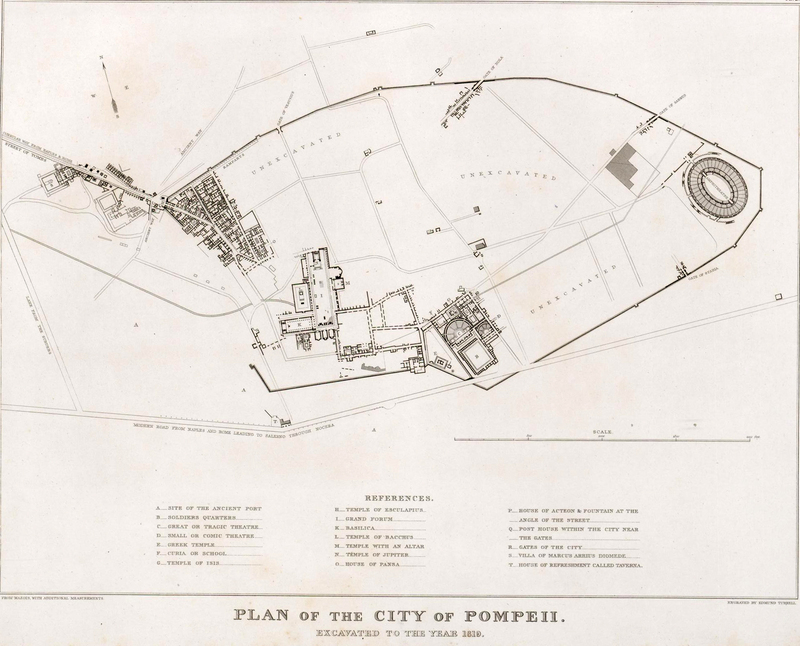 Plan of Pompeii from Harper's Handbook, 1872. Plan der ausgegrabenen Theile Pompejis zur Übersicht der Hauptbauperioden und der Nivellirung 1875. 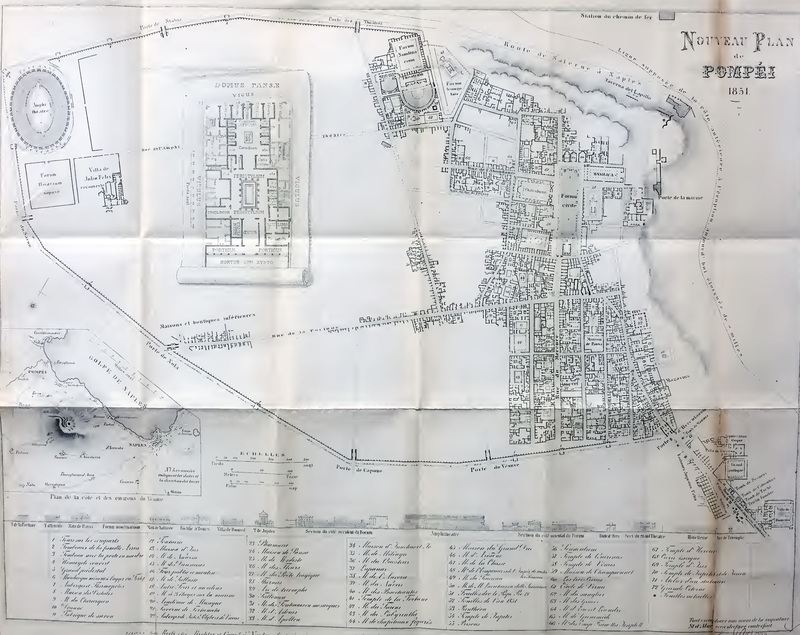 Plan of the excavated parts of Pompeii with overview of the main building periods and the levels 1875. 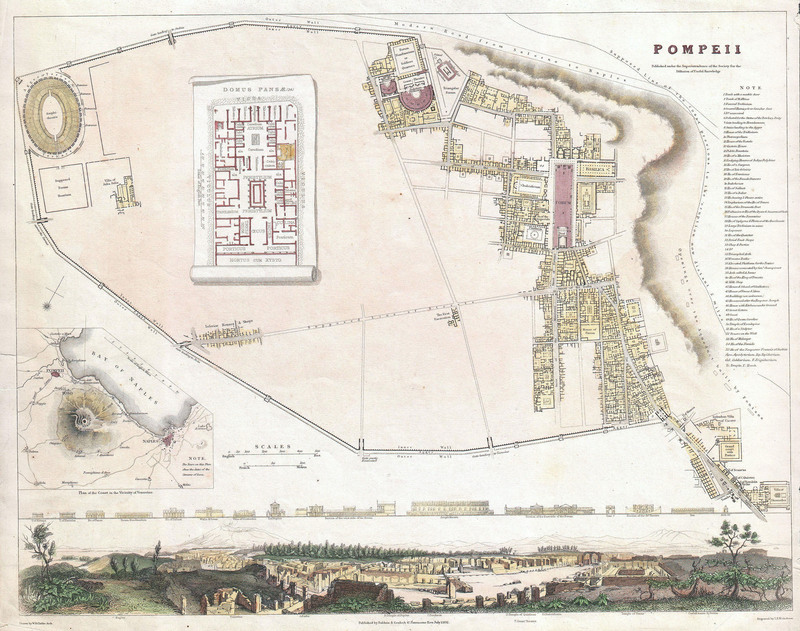 Nouveau Plan de Pompei by Scafati. 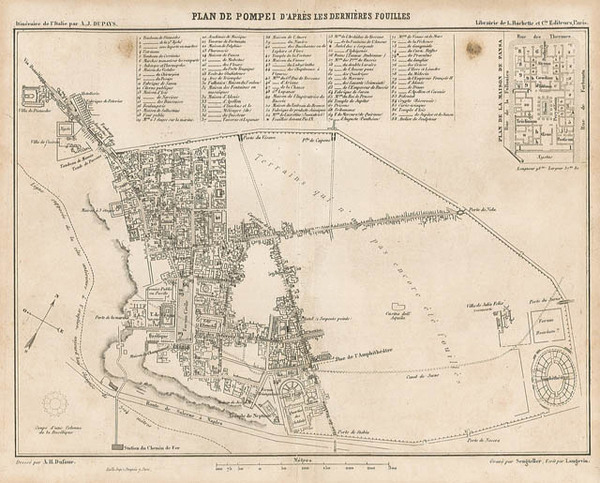 French language version of the plan of Pompeii as in 1876. 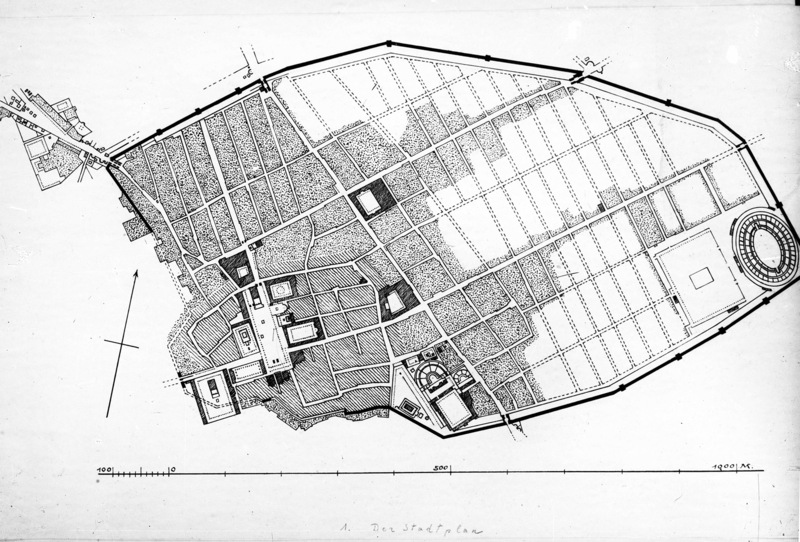 Plan of Pompeii in 1877 by E. Presuhn. 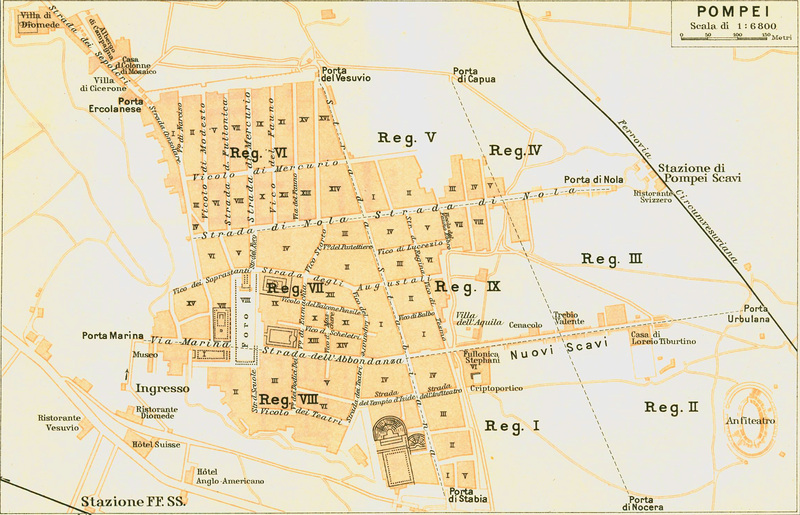 Plan of Pompeii showing excavations up to 1878. 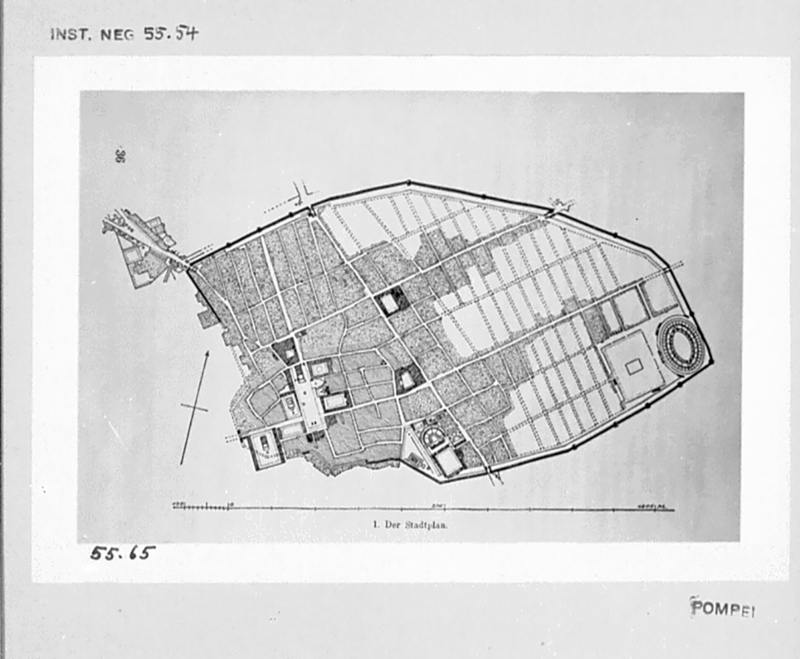 Plan of Pompeii in 1878 by E. Presuhn. 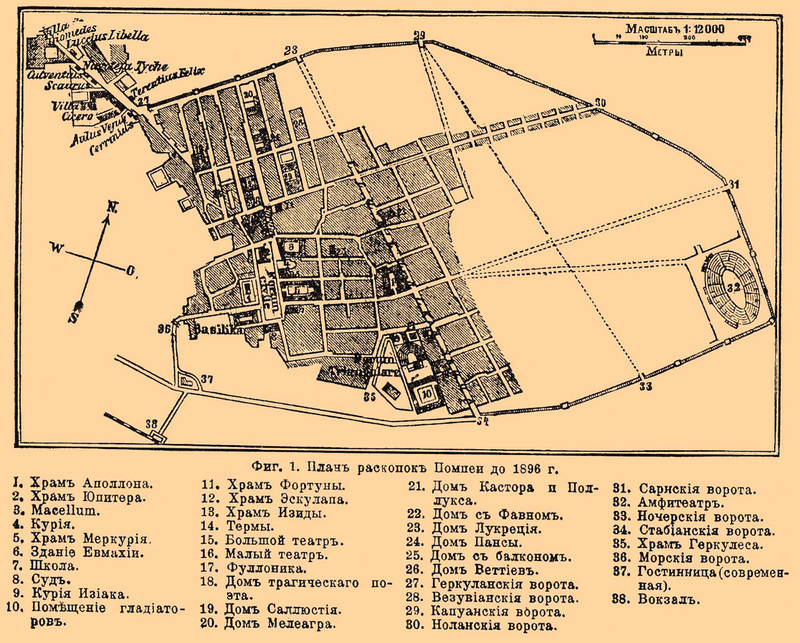 Shows excavations from 1874 to 1878. 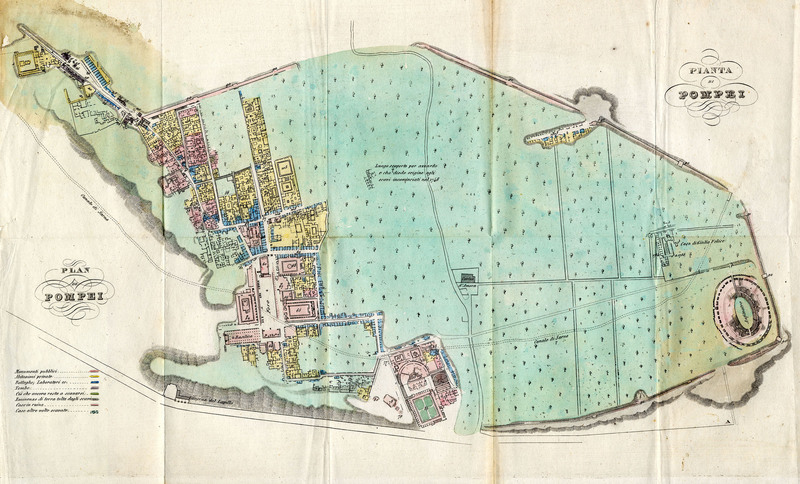 Plan with Stabiae, Pompeii and Bay of Naples by G. Tascone. Published in Ruggiero M, Pompei e la Regione sotterato nel Vesuvio nell'anno LXXIX, 1879. 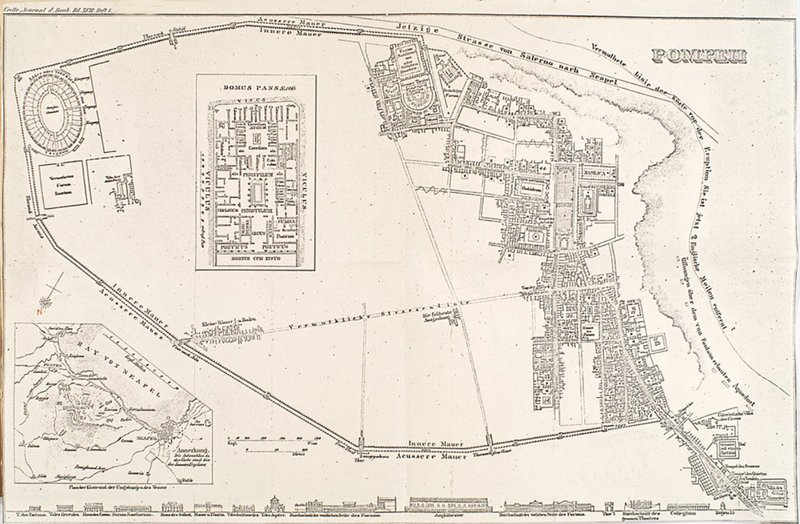 Plan of Pompeii in 1881 by E. Presuhn. 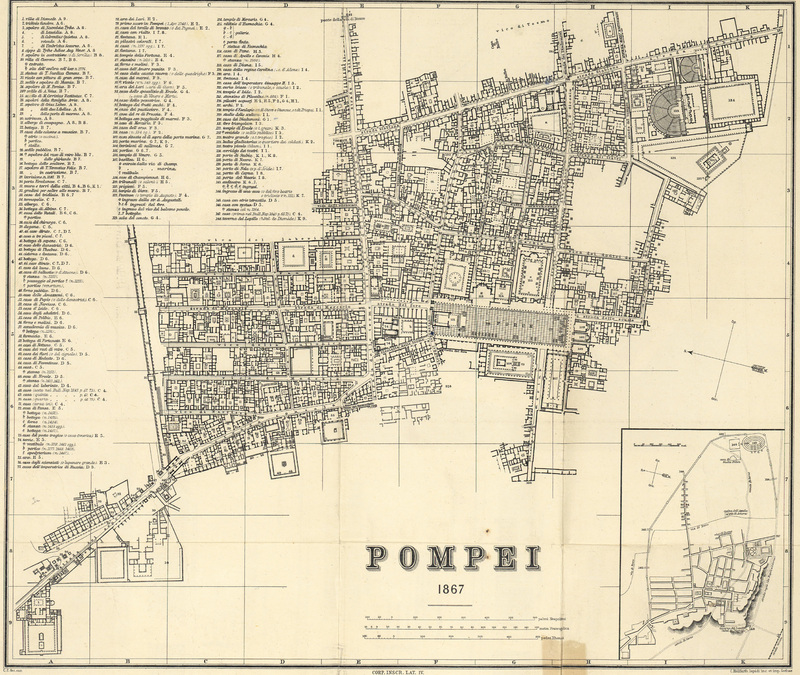 Map of Pompeii published by E. Presuhn in 1882. Shows the excavations from 1874 to 1881. 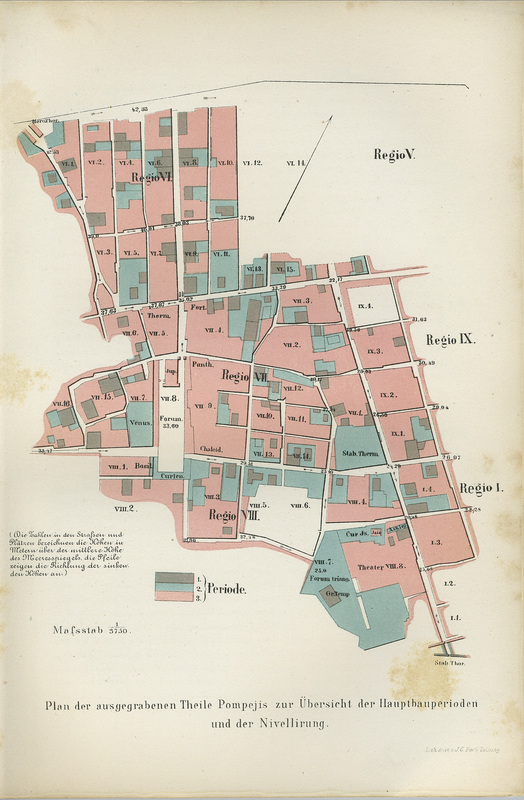 Gesamtplan der Stadt Pompeji mit dem Ergebnis der Ausgrabungen bis 1882. 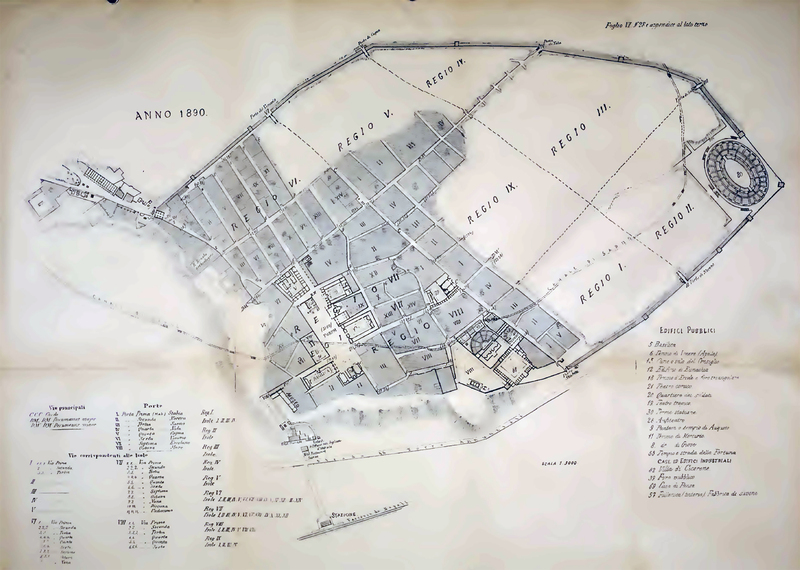 Overall plan of the city of Pompeii with the result of the excavations until 1882. 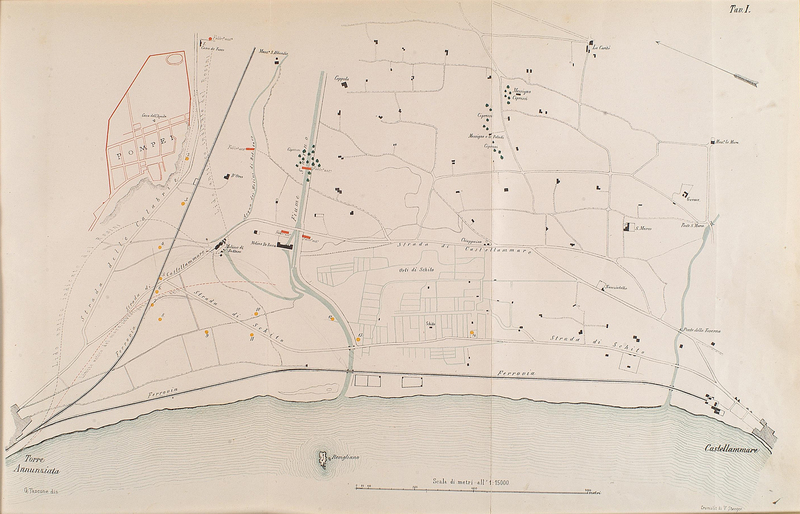 See Overbeck J. und Mau A. Pompeji in seinen Gebauden Alterthumen und Kunstwerken 1884..
Plan of Pompeii in 1887 from Murano D., 1894. Pompei donde venivano le acque potabili ai castelli acquarii. 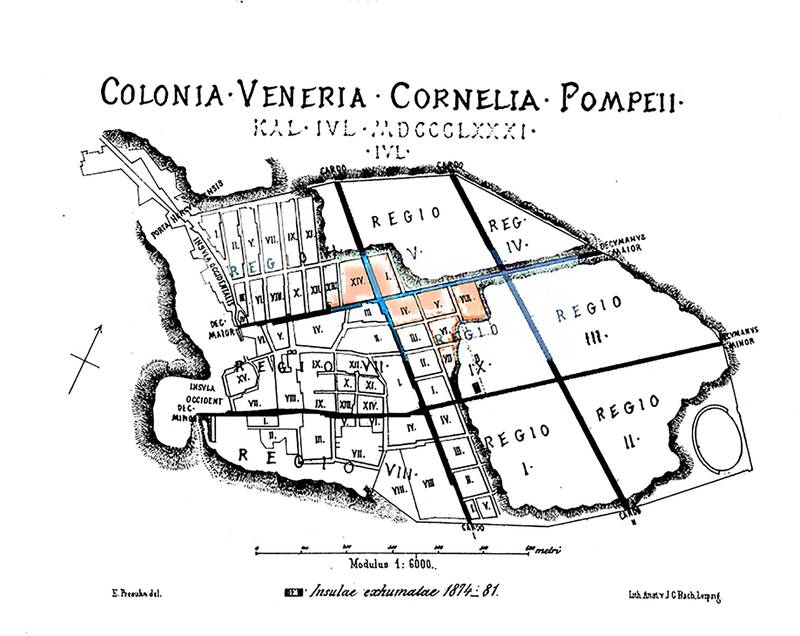 Plan of Pompeii published in Rolfe E. N., 1888. Pompeii Popular and Practical. 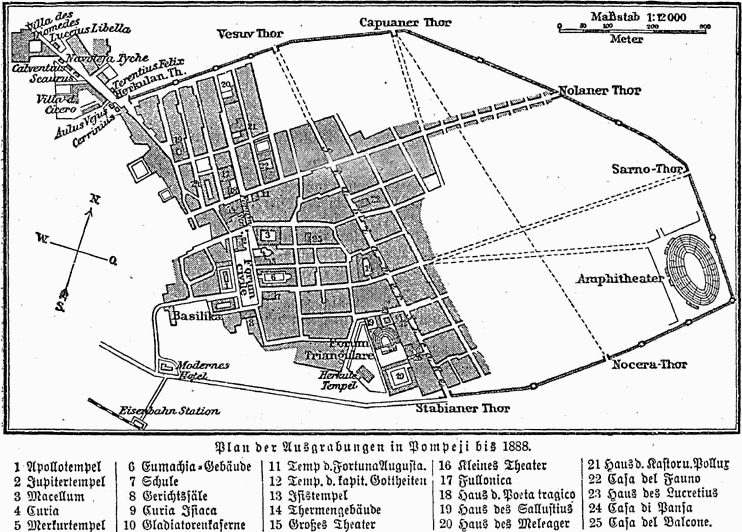 Plan of Pompeii in 1888 published in Meyers Konversationlexikon. Photo Wikimedia. 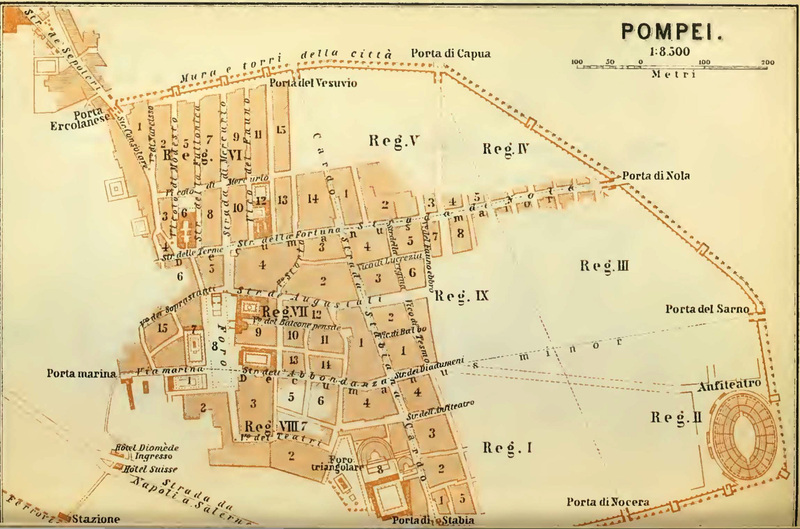 Plan of Pompeii in 1890 from Murano D., 1894. Pompei donde venivano le acque potabili ai castelli acquarii. 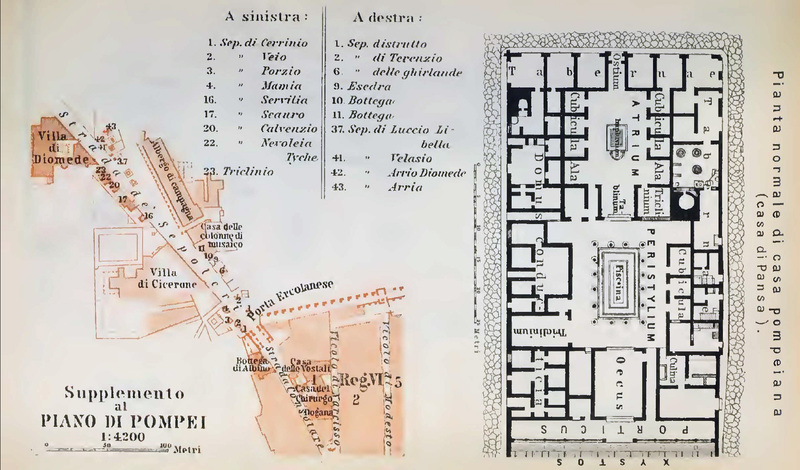 Plan of Pompeii published in 1890 in Niccolini F, 1890, Le case ed i monumenti di Pompei, Vol. 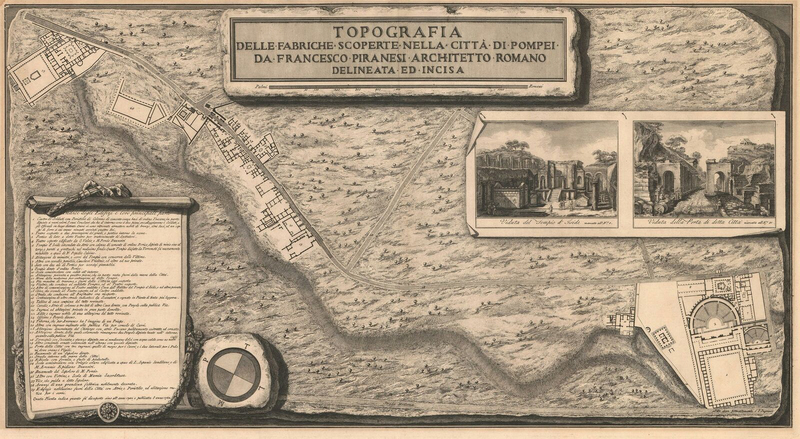 III, Topografia di Pompei, Tav II. 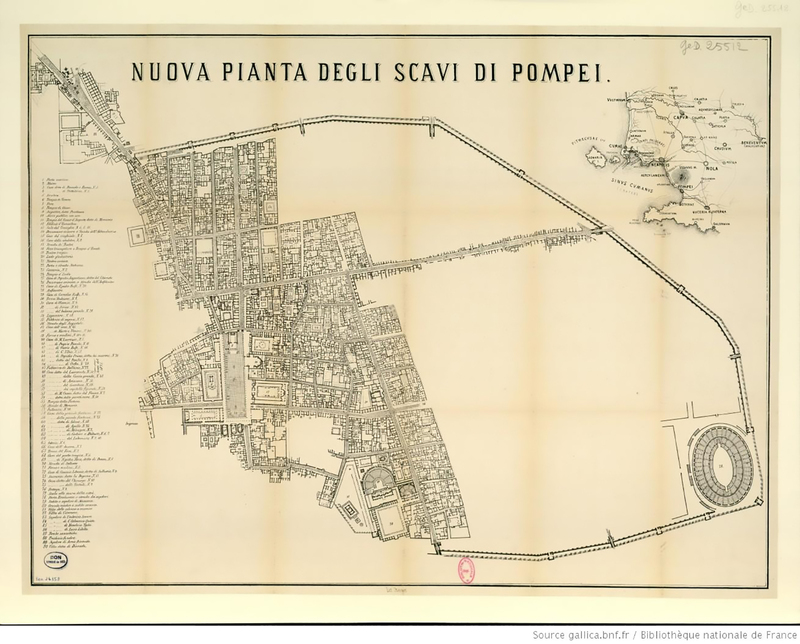 Plan of Pompeii in 1893 by Baedecker. 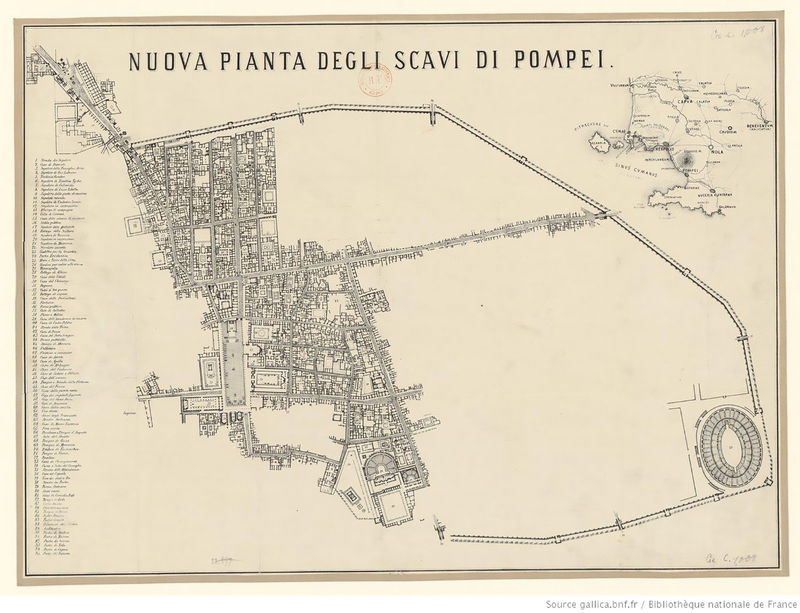 Plan of Pompeii produced in 1890s. 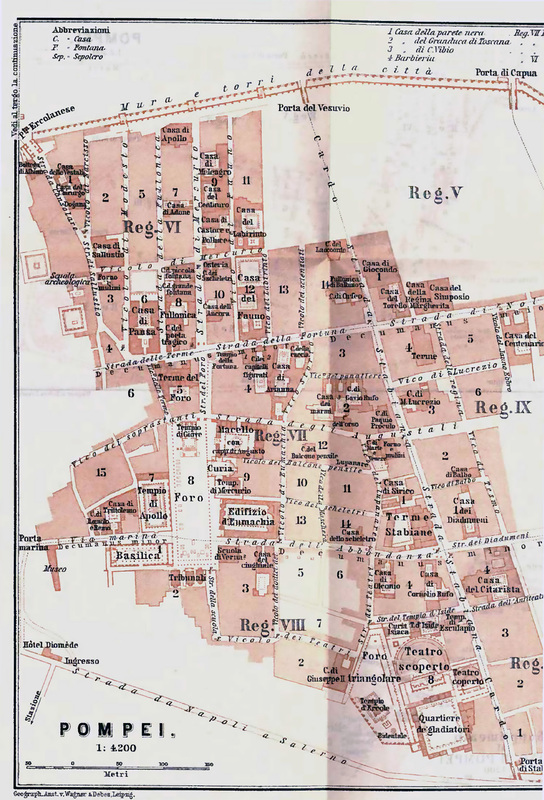 Plan of Pompeii in 1896 published in Brockhaus and Efron Encyclopedic Dictionary. Photo Wikimedia. 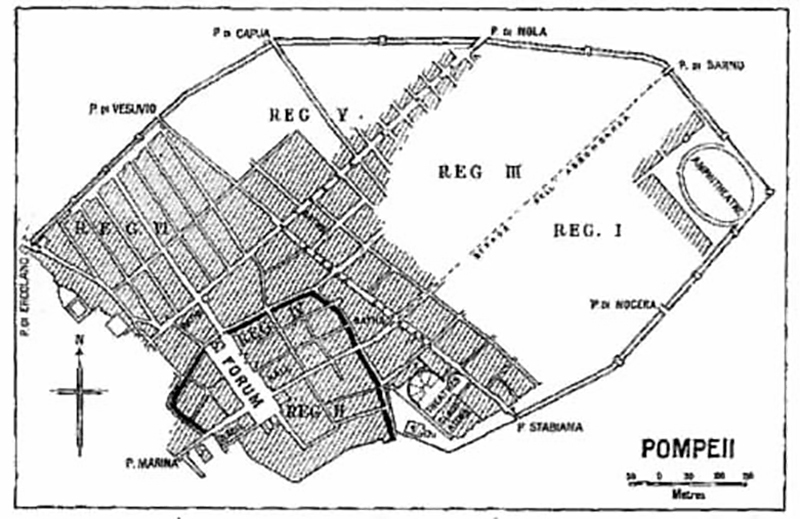 Plan of Pompeii published by Pierre Gusman in Pompei La Ville, Les Moeurs, Les Arts, 1899, p. 35. 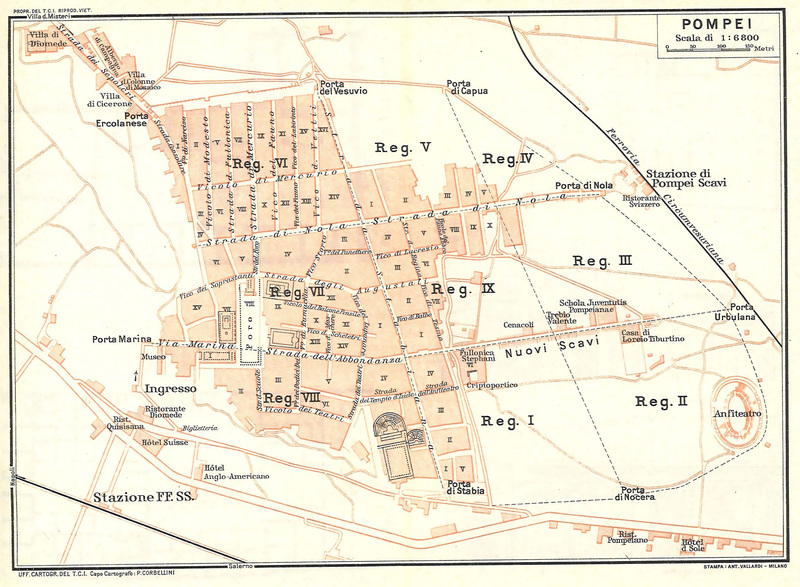 Plan of Pompeii in 1900 published by Baedeker. Detailed plan of the excavations published by Baedeker in 1900. 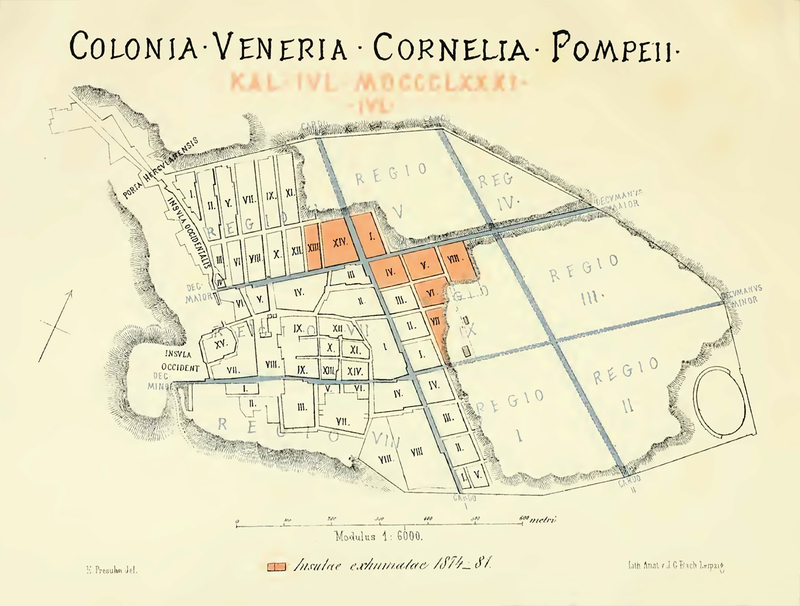 A second plan supplement contained Porta Ercolano and Via dei Sepolcri, see below. Detailed plan of the excavations published by Baedeker in 1900. Supplement with Porta Ercolano and Via dei Sepolcri. 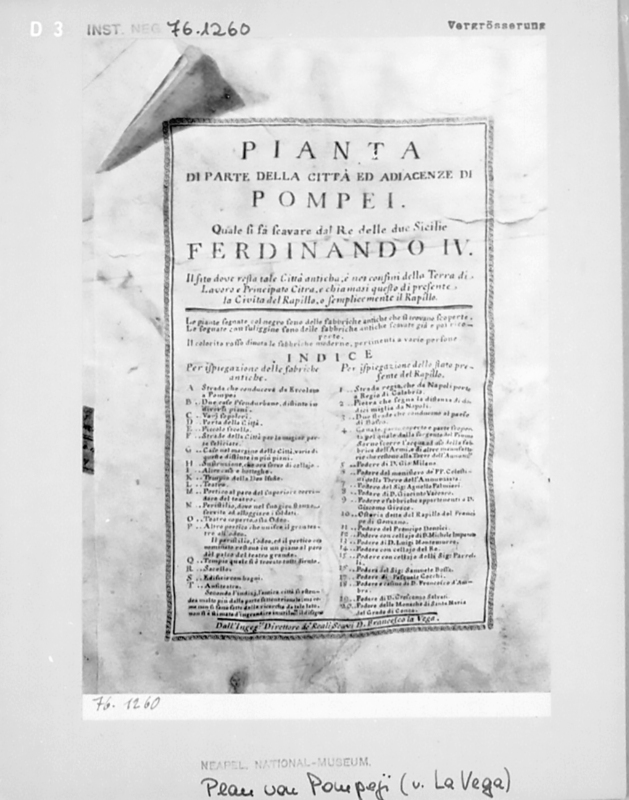 It also contains a plan of the House of Pansa. 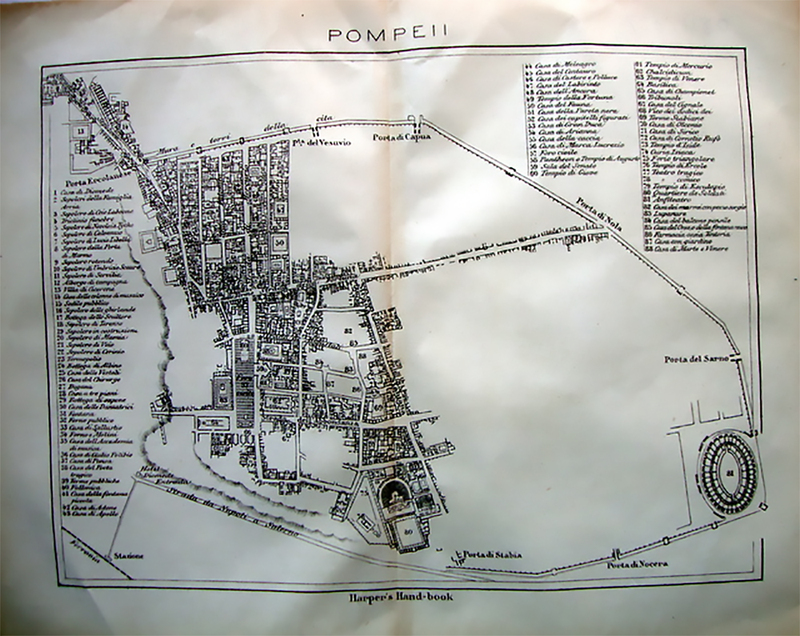 Plan of Pompeii published in Mau and Kelsey, Pompeii its Life and Art, 1901, plan 1. 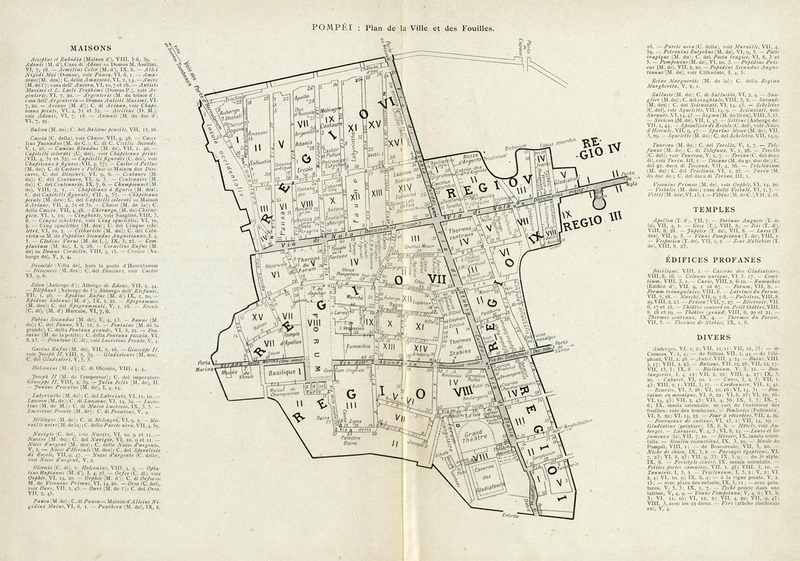 Plan de la ville et des fouilles de Pompéi, publié par H. Thédenat, Pompéi Vie Privée, 1906. 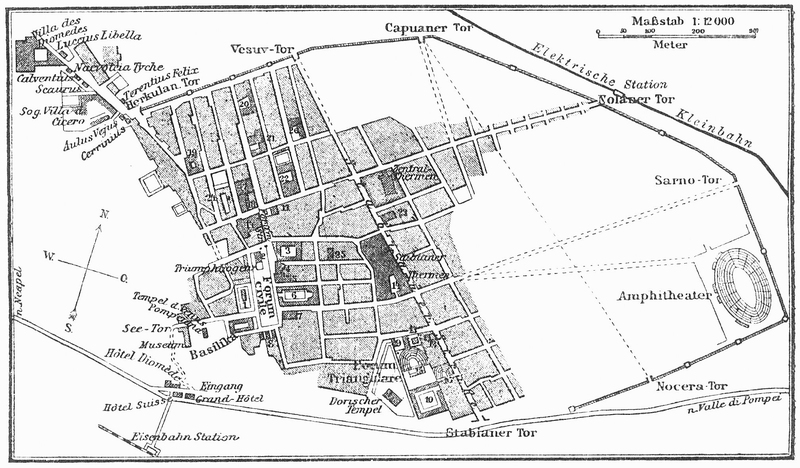 Plan of Pompeii in 1906 published in Meyers Konversationlexikon. 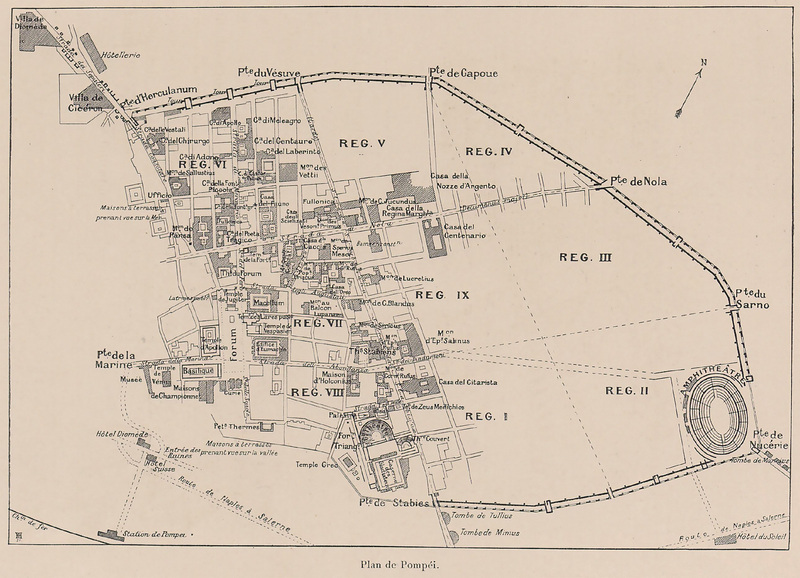 Plan of Pompeii in 1910 after Mau. 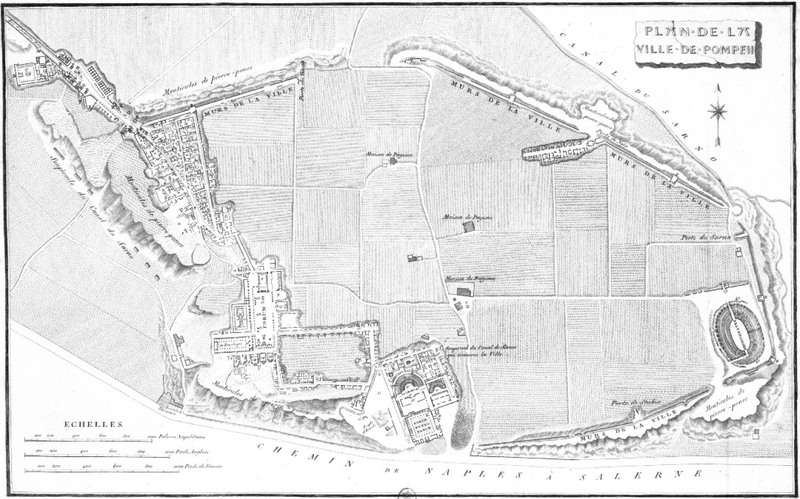 The original settlement is outlined in black. 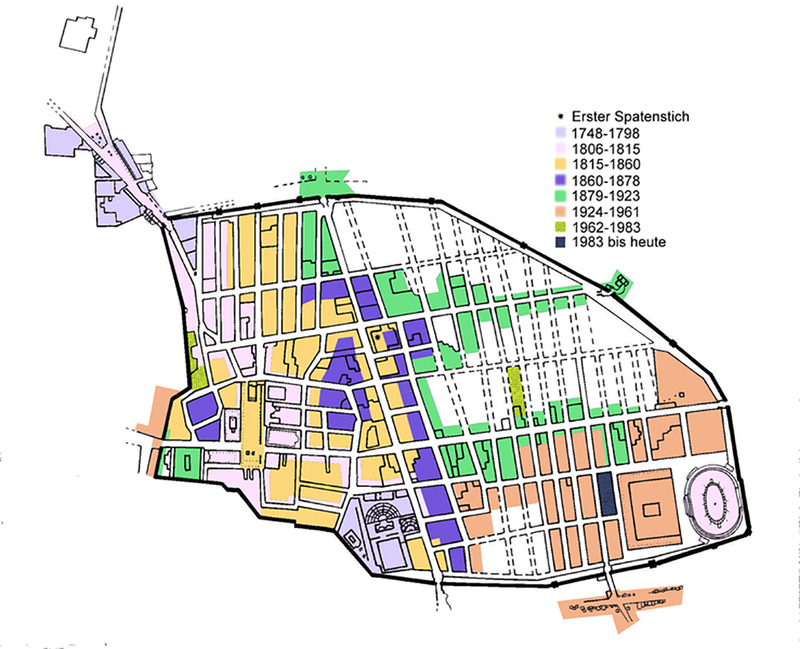 Photo Project Gutenberg, Ancient Town-Planning, by F. Haverfield, 1913, fig. 13. 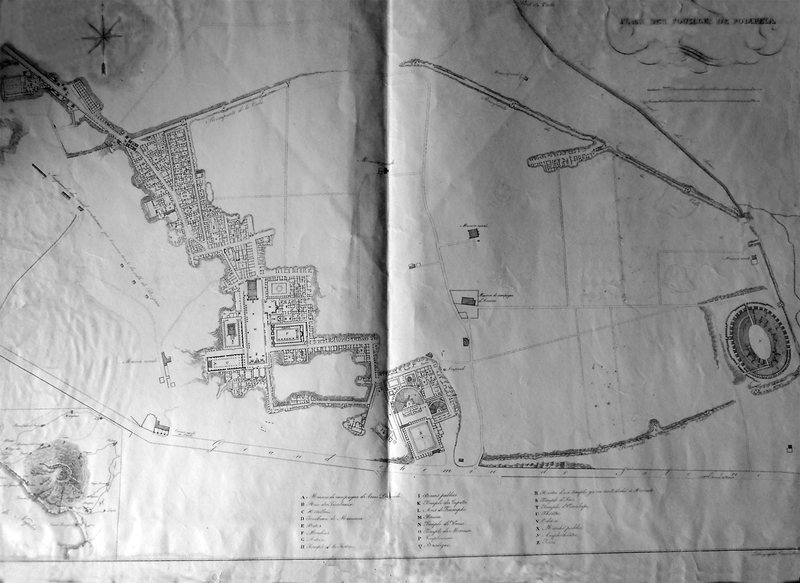 Plan of Pompeii in 1925 by Murray. 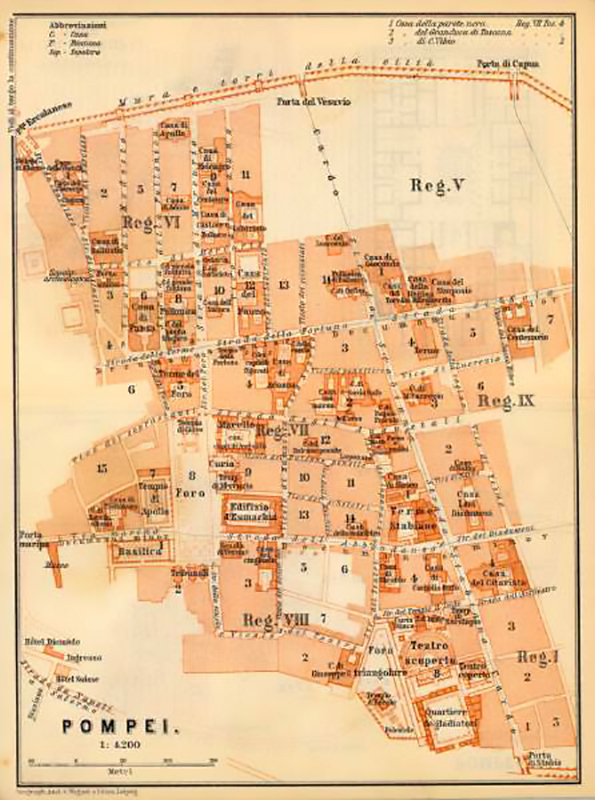 Map of Pompeii by Baedecker, published in 1928. Courtesy of Rick Bauer. 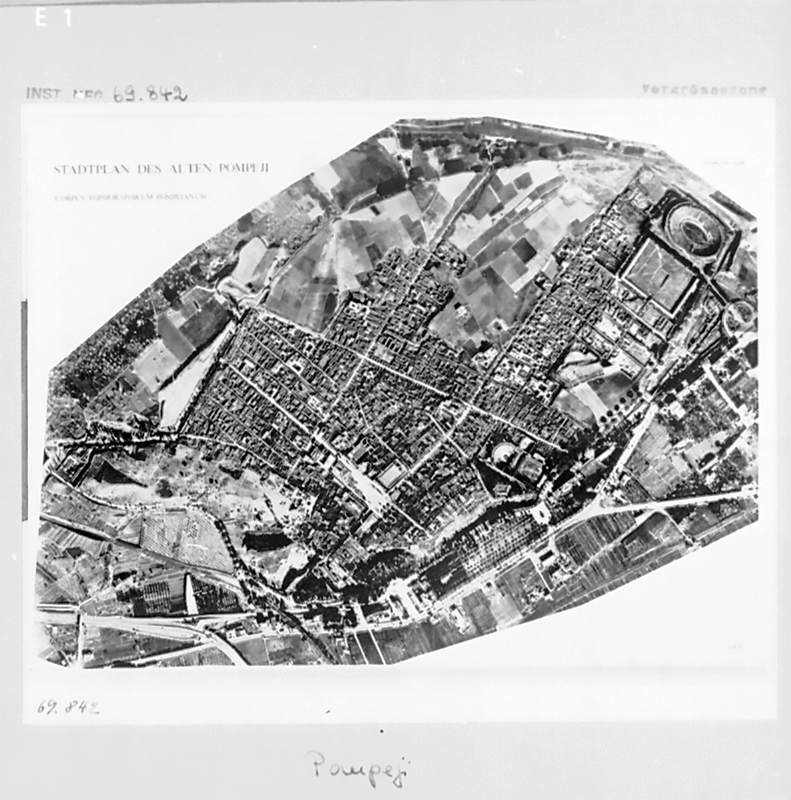 Plan Pompeii in 1929. Photo courtesy of Deutsches Archäologisches Institut. Inst neg 1929.633. 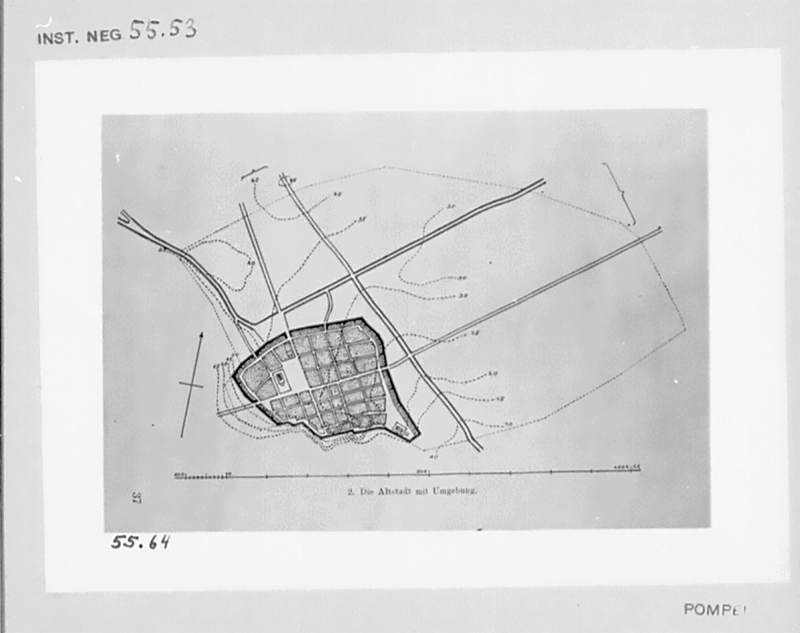 Plan of Pompeii received by the Deutsches Archäologisches Institut in 1955. It is a photo by Tatiana Warsher W.399 and in the inventory record it says it is copy by her of an original by A von Gerkan? The handwriting is hard to decipher. It may relate to the 1930s or up to 1955. 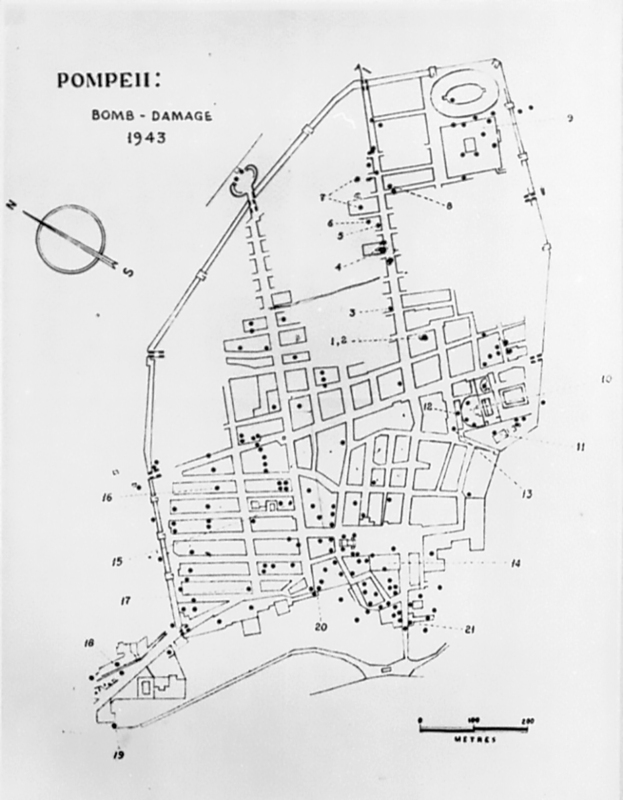 Plan of Pompeii 1943 showing where bombs landed and bomb damage. Photo courtesy of Deutsches Archäologisches Institut. Inst.neg. 65.2004. See note 1 below. 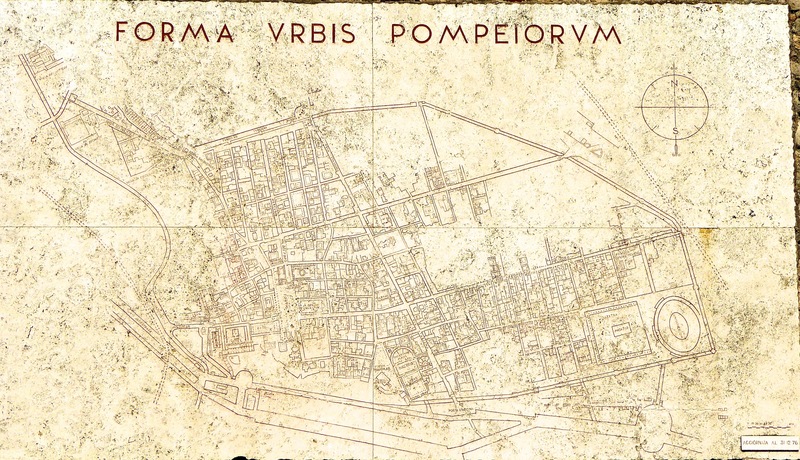 1947 plan of Pompeii entitled the FORMA VRBIS POMPEIORVM. This plan is cut onto a slab of travertine 5m wide by 2.73m high and was completed in 1947. It was installed in the Larario dei Pompeianisti located between the Porta Marina and the Antiquarium when the Larario was opened in 1948. It was updated on 31st December 1976. It can still be seen today as you enter or exit via the Porta Marina. 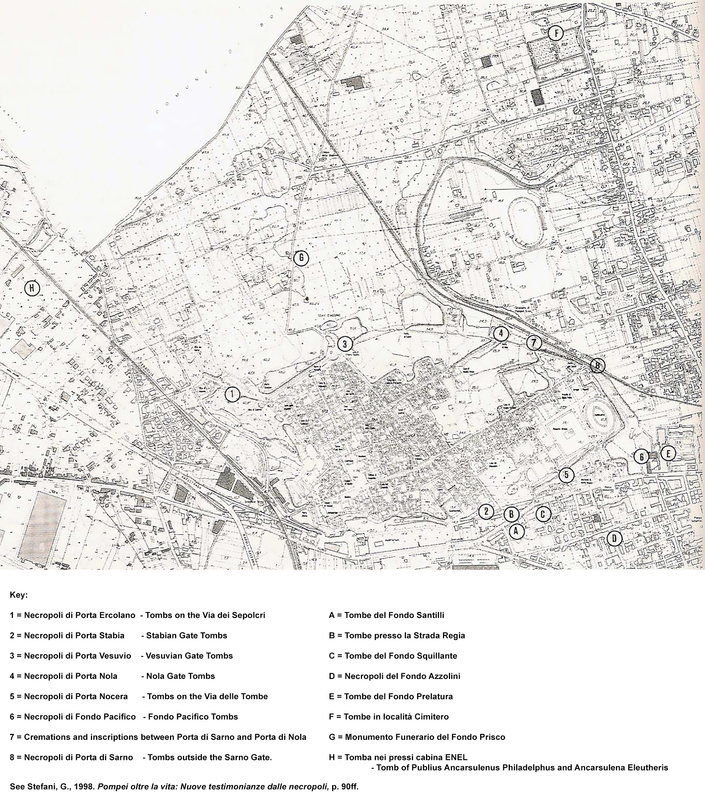 1951 plan to illustrate the 5 year plan of Pompeian excavation. The area in white is already excavated. The shaded area is in the course of excavation. The area in black is scheduled for excavation in the future. 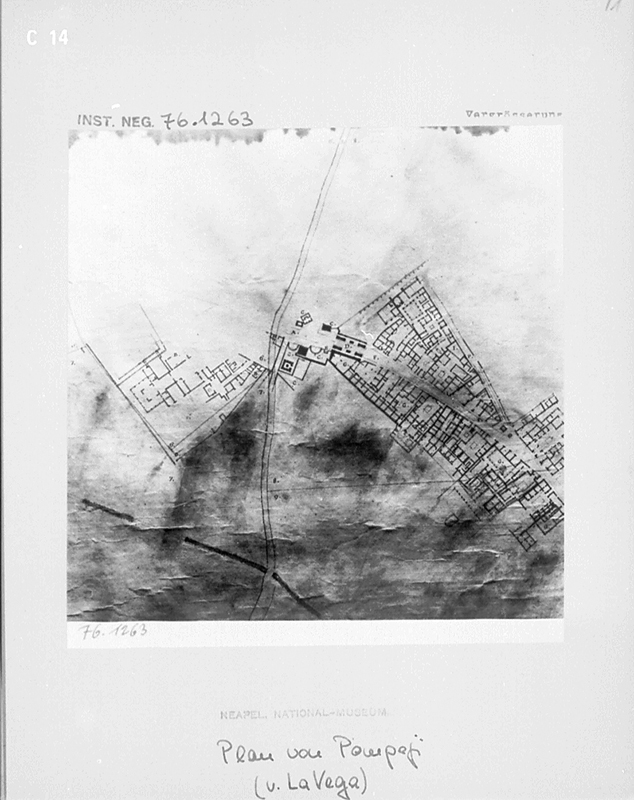 Plan of Pompeii in 1955. Photo courtesy of Deutsches Archäologisches Institut. Inst. neg. 55.54 55.65. 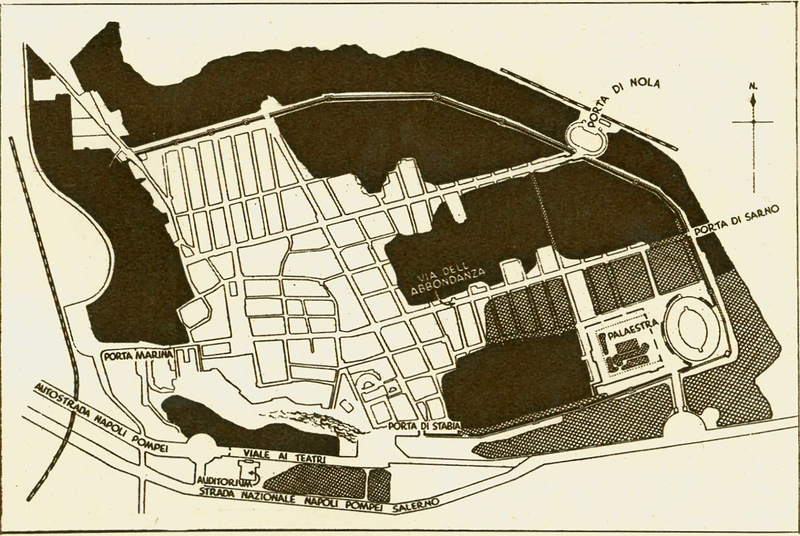 1955 plan of Pompeii showing old city and contours. Photo courtesy of Deutsches Archäologisches Institut. Inst. neg. 55.53 55.64. 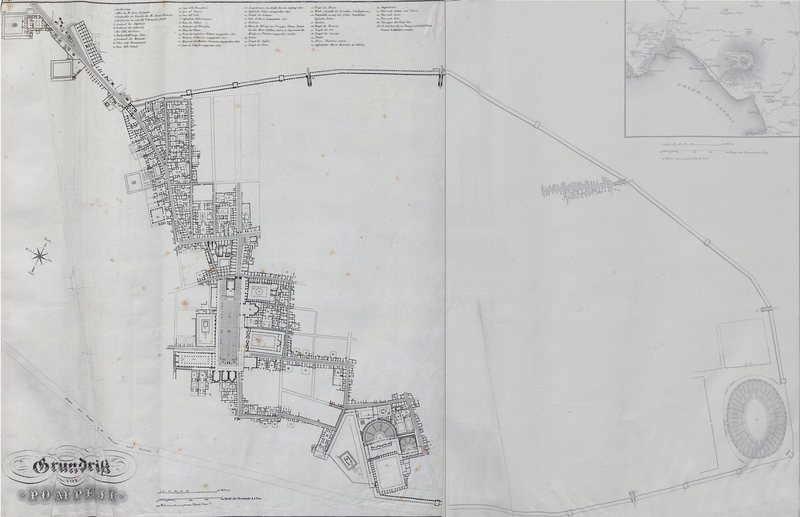 CTP plan of Pompeii in 1969. Photo courtesy of Deutsches Archäologisches Institut. Inst. neg. 69.842. 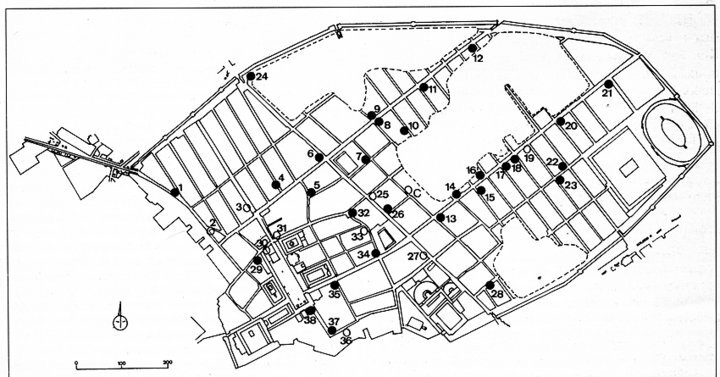 Timeline map of the excavations in Pompeii up to and after 1983. Photo Wikimedia. 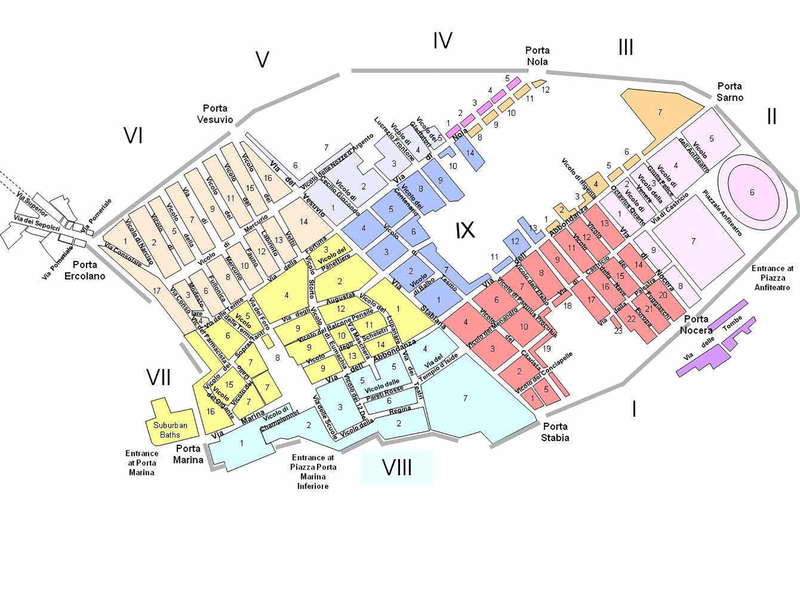 Plan of Pompeii in 1998. Photo courtesy of University of Virginia. 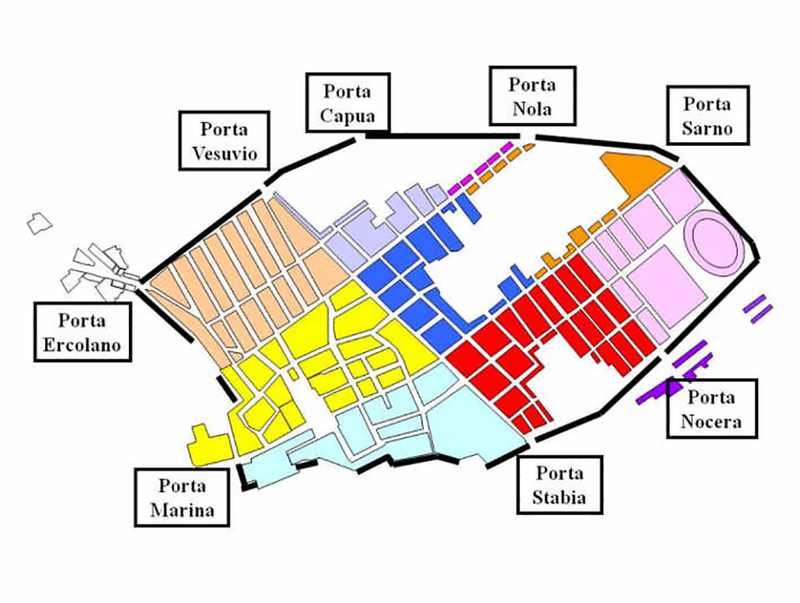 Plan of Pompeii in 2007 showing all Pompeii building entrances. Photo Courtesy of John Dobbins and Pedar Foss, World of Pompeii, DVD. 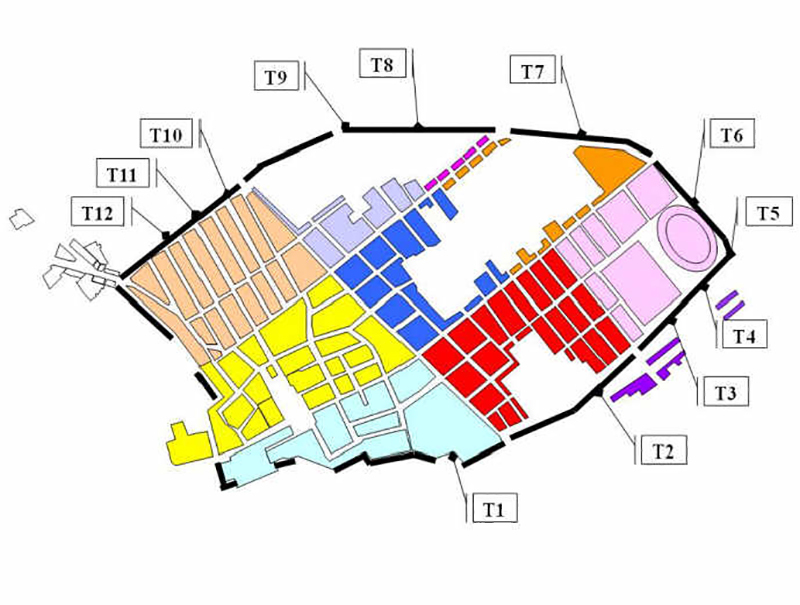 Plan of Pompeii streets in 2007. Photo Courtesy of John Dobbins and Pedar Foss, World of Pompeii, DVD. Timeline plan of Pompeii excavations to 2007. Photo Courtesy of John Dobbins and Pedar Foss, World of Pompeii, DVD, Fig3-1. 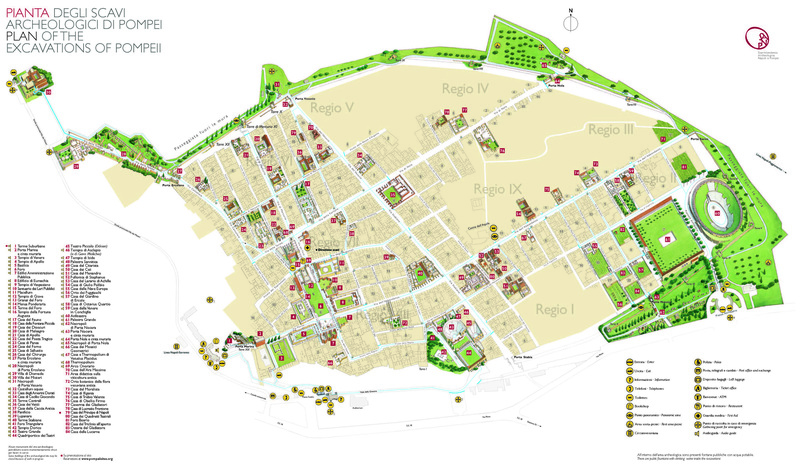 Plan of Pompeii in 2008 showing UNESCO world heritage zone. 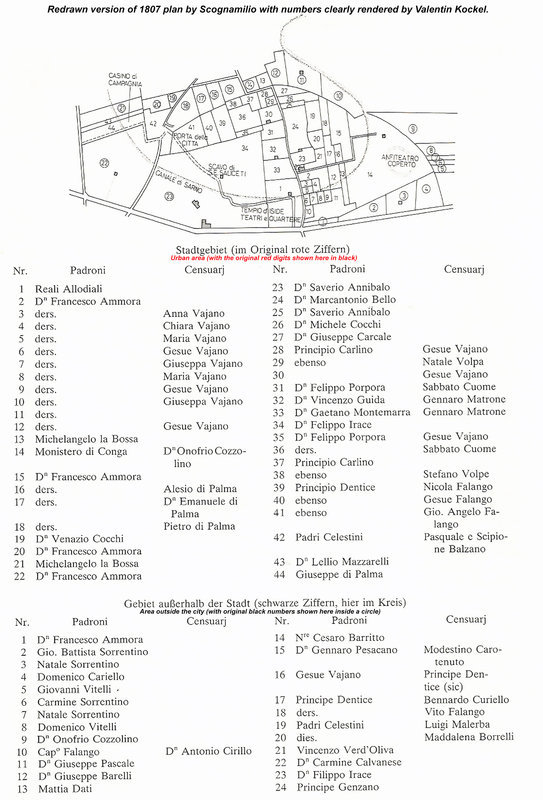 2011 SANP Plan of street altars and shrines in Pompeii. 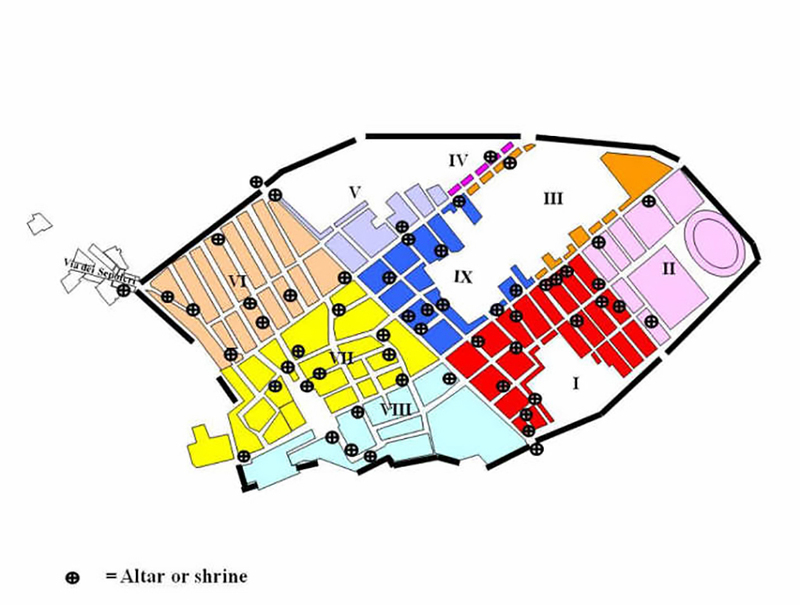 Comprehensive pompeiiinpictures plan of street altars and shrines in Pompeii. To view the interactive version of this plan use the Altars button on the left of this page. Comprehensive pompeiiinpictures plan of fountains in Pompeii. To view the interactive version of this plan use the Fountains button on the left of this page. Current pompeiiinpictures plan of the gates of Pompeii. To view the interactive version of this plan use the Gates button on the left of this page. 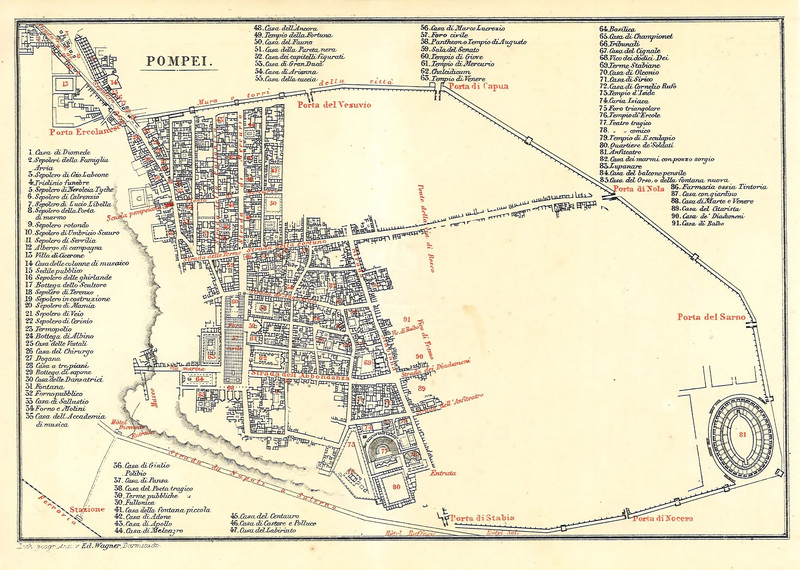 Comprehensive pompeiiinpictures plan of every street in Pompeii. To view the interactive version of this plan use the Streets button on the left of this page. Current pompeiiinpictures plan of tombs outside the gates and the area around Pompeii. 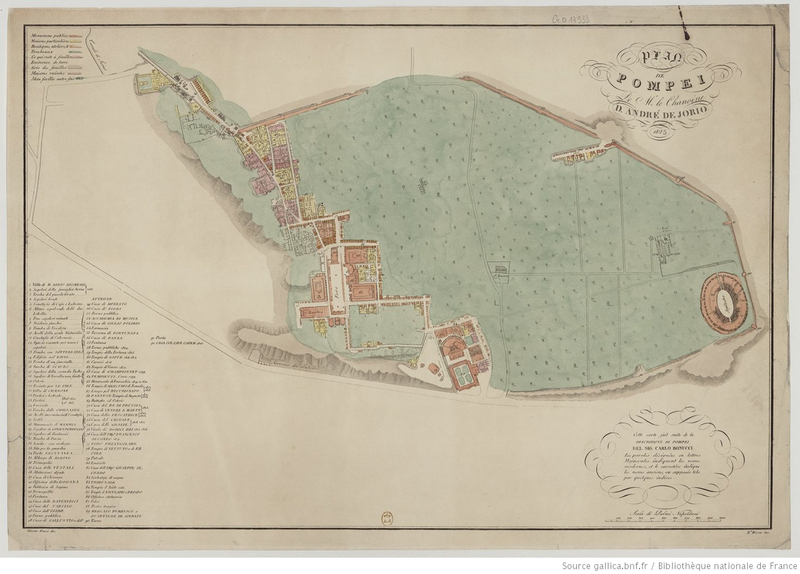 To view the interactive version of this plan use the Tombs button on the left of this page. See Stefani, G., 1998. Pompei oltre la vita: Nuove testimonianze dalle necropoli, p. 90ff. Current pompeiiinpictures plan of the towers around the walls of Pompeii. To view the interactive version of this plan use the Towers button on the left of this page. 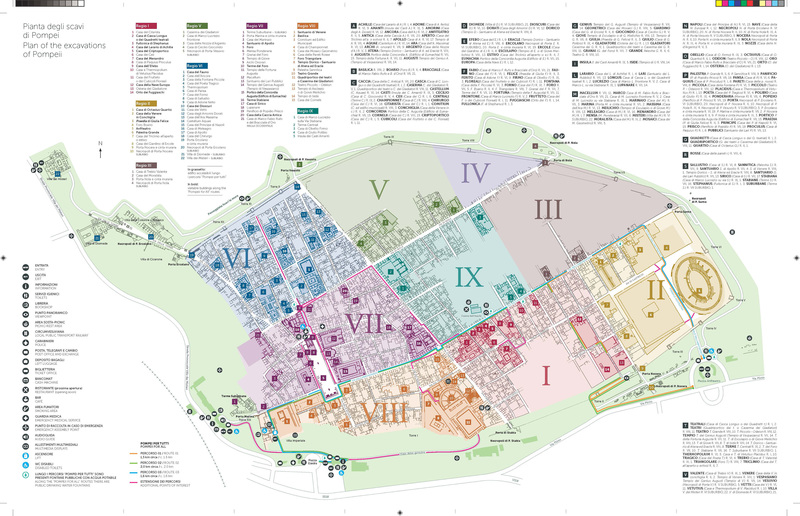 2014 Soprintendenza Pompeii tourist plan showing the main buildings. Not all of these are currently open to the public. 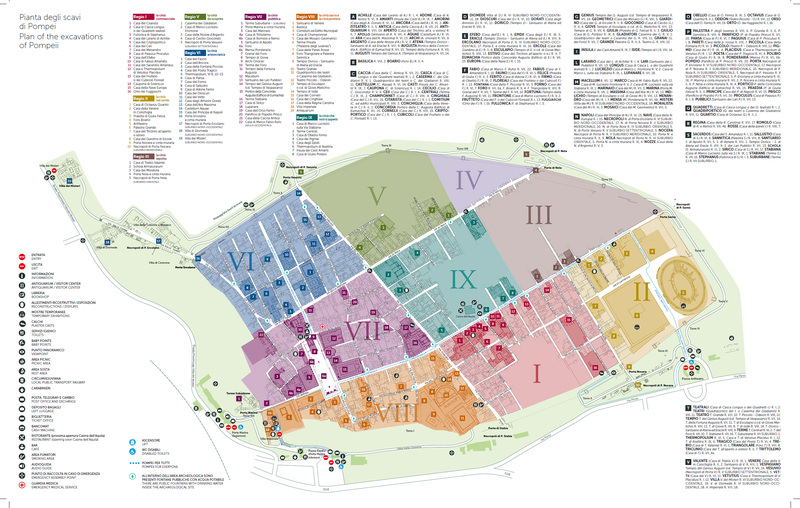 2015 Soprintendenza Pompeii tourist plan showing the main buildings. Not all of these are currently open to the public. 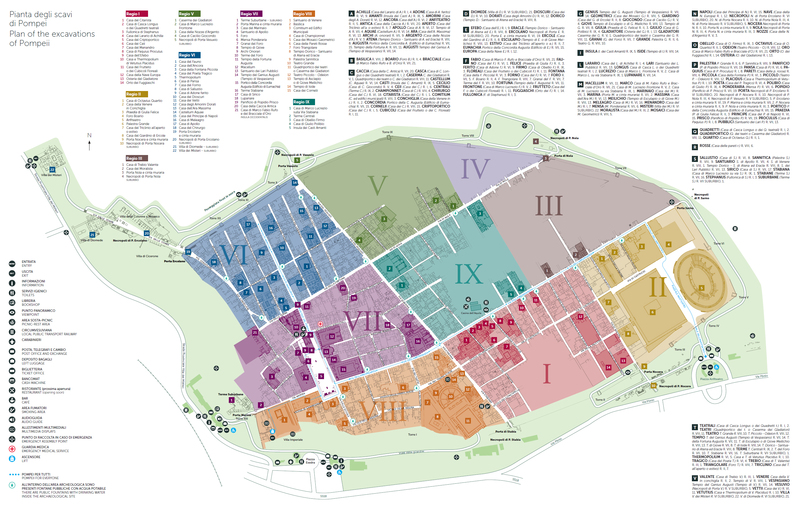 2016 Soprintendenza Pompeii tourist plan showing the main buildings. Not all of these are currently open to the public. 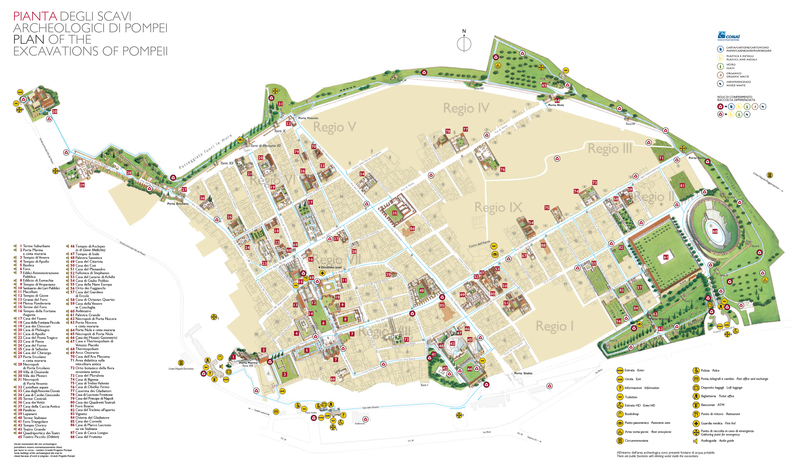 2017 Soprintendenza Pompeii "Pompeii per Tutti" plan showing the main buildings. Visitable buildings along the “Pompeii for All” routes are shown in bold. Not all of the buildings may currently be open to the public. 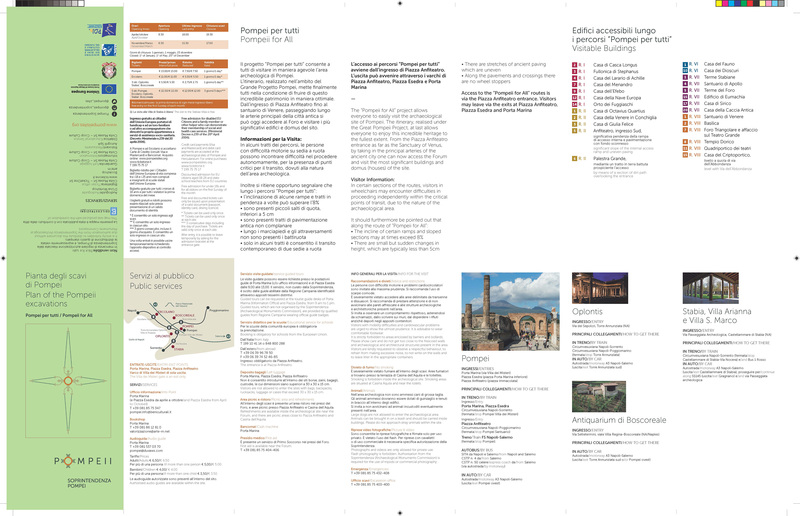 2017 Soprintendenza Pompeii "Pompeii per Tutti" plan accompanying narrative showing details of entry, access, routes and visitable buildings along the “Pompeii for All” routes. 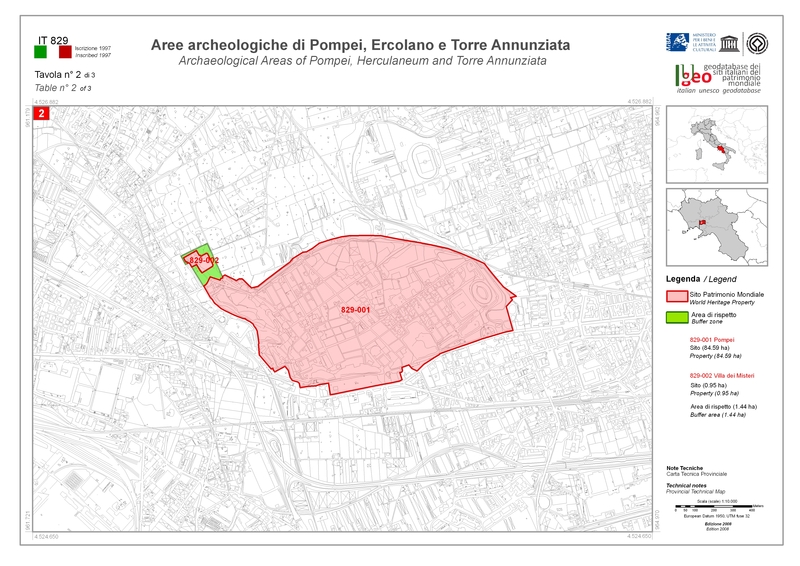 2017 Parco Archeologico di Pompeii plan showing the increasing number of buildings open. Not all of the buildings may currently be open to the public. 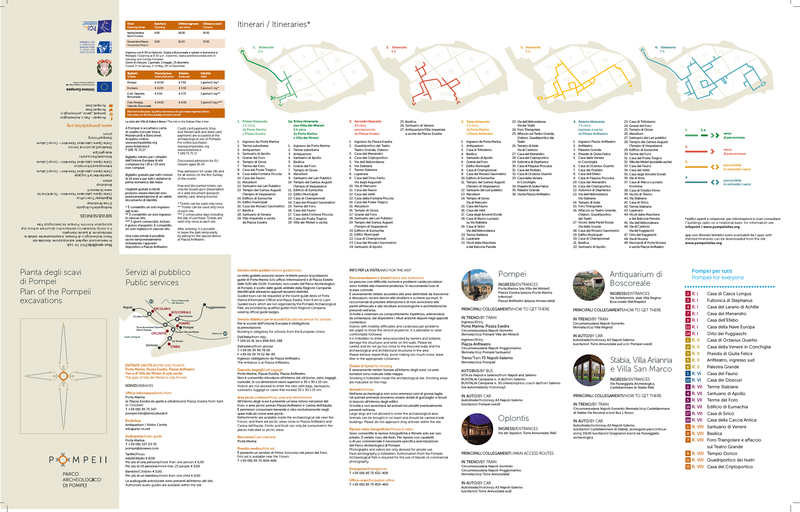 2017 Parco Archeologico di Pompeii plan's accompanying narrative showing details of entry, access, routes, itineries and visitable buildings. British officer’s account of Allied bombing at Pompeii. From The Times, 9 November, 1943.